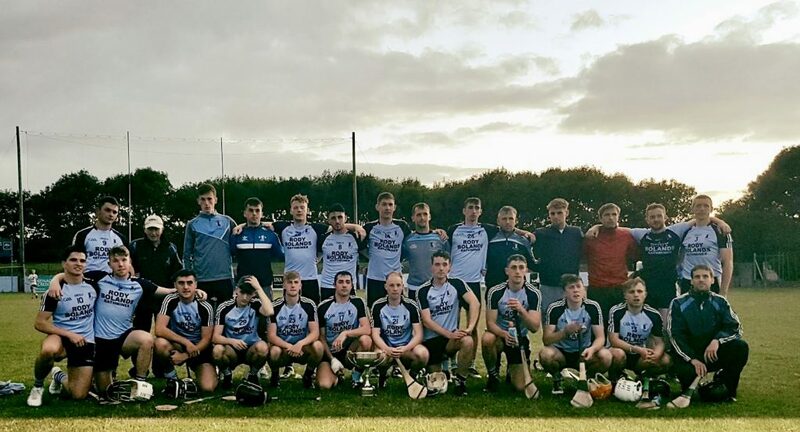 Commiserations go to our senior hurlers who were knocked out of the North Tipperary senior hurling championship on Sunday in Dolla 0-14 to 0-11. The lads have two weeks off before travelling to Annacarty to play Éire Óg Annacarty Donohill in the next round of the county league. Both of our junior teams are in league action next weekend. Our junior-A side meet Roscrea in MacDonagh Park while the junior-B side have to travel to Borrisokane to play the home side. Please check our website for details of these fixtures. Our junior football team face Lorrha and Dorrha on Sunday next at 12 noon in Puckaun in the opening round of the county championship. Best of luck to all involved. Our minor hurlers defeated Kilruane MacDonagh’s in the league 2-23 to 0-16. Our next game is against Ballina on Wednesday at 7pm in MacDonagh Park. Sarah Quigley. She’s a keeper! 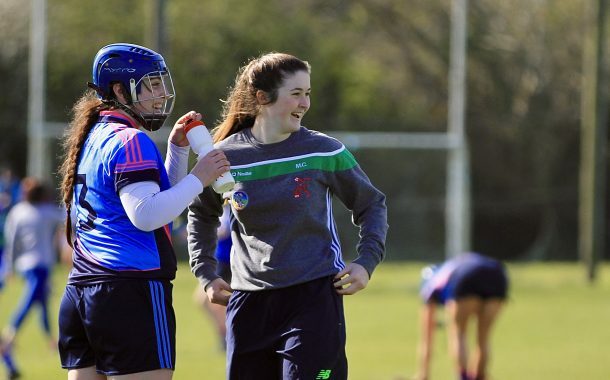 Everyone in the club sends our best wishes to Sarah Quigley and the Tipperary intermediate camogie team as they get ready to face Kilkenny in the Littlewood’s National Camogie League division two final on Easter Sunday. Sarah has proven herself to be one of the country’s top goalkeepers and it is no surprise to anyone who has watched her progress over the years to see her don the Blue & Gold with distinction. 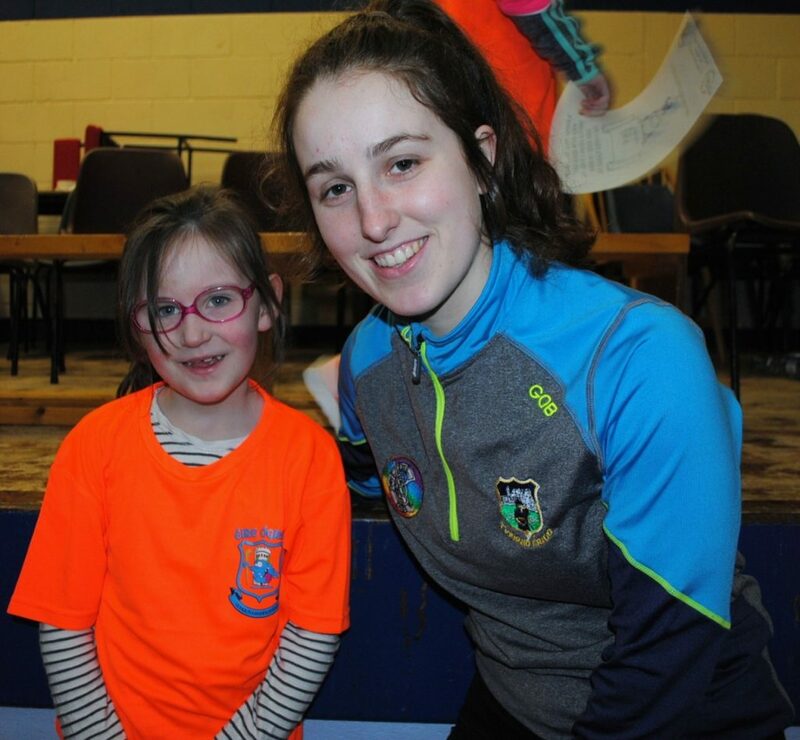 Sarah is joined on the team by Nenagh Handball Club star Sinéad Meagher and we send our very best to all the panel and management. 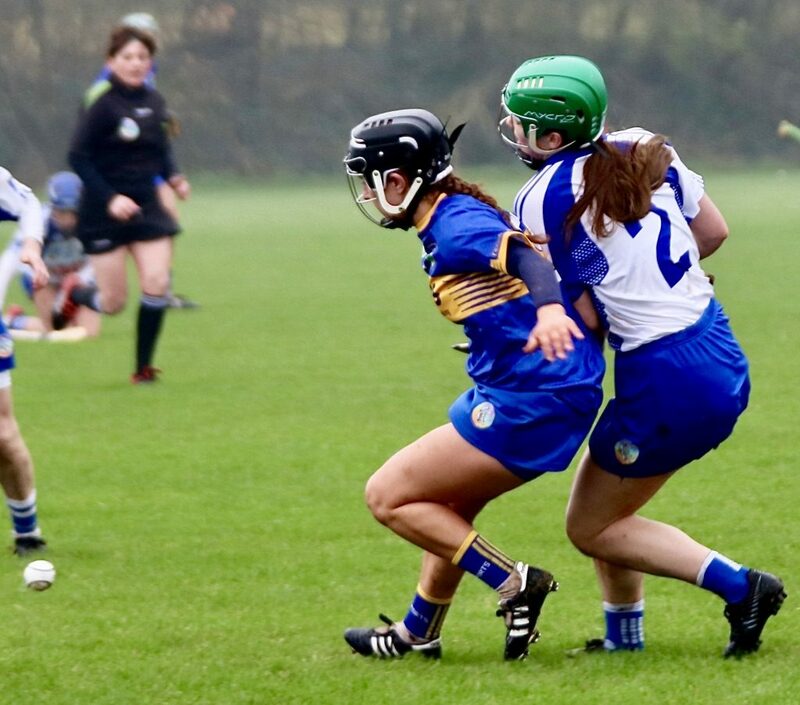 After a gallant effort and a huge work rate, the Senior team lost 3-9 to 1-6 to Clonoulty Rossmore with four players making their first senior starts for Éire Óg. 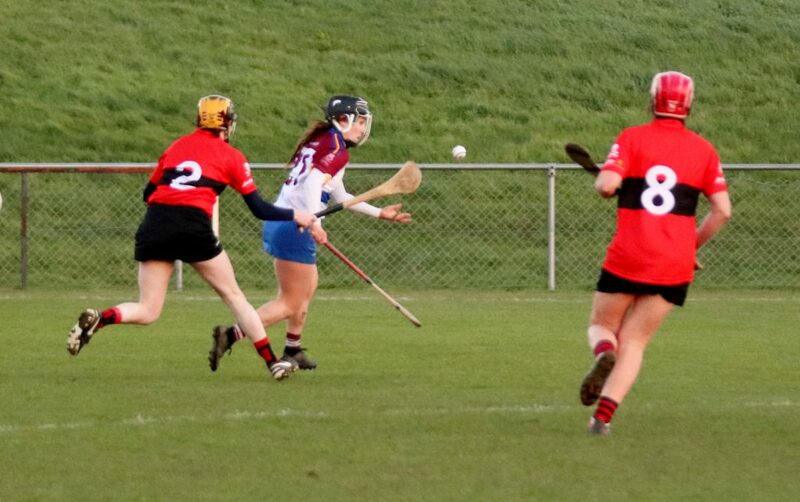 Details of our next match against Cashel Camogie Club to be confirmed. Very well done to everyone. Training continues Mondays and Thursdays from 6.30pm to 7.30p.m. The final group match against Burgess Duharra is fixed for Wednesday in Kilcolman. It is a must win game for the team to stay in the competition. Players are encouraged to make every effort to attend training. The under-12s played their first full game in a challenge match on Saturday morning against Kiladangan. After an excellent first half, some of the girls had played an under-14 game the evening before and this took its toll on them unfortunately in the latter stages of the challenge match. Training continues Mondays and Thursdays at 5.30pm. The under-10’s training continues every week at 5.30p.m. on Monday and Thursday evenings. Under-6 and Under-8s training takes place every Thursday 6pm to 7pm. Parents are encouraged to lend a hand. New members welcome. 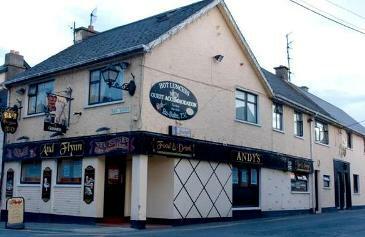 Nenagh Éire Óg Camogie Club are having their main fundraising event of the year at the Hibernian Inn on 27th of April. The ‘Come Dine With Me’ event promises to be a great evening with music and a local ‘celebrity chef’ organised. 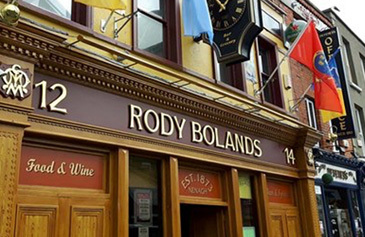 Ticket price of €20 includes a two-course meal & glass of wine. All ticket purchasers will be entered into a draw for €100 and there’ll be a large number of spot prizes to giveaway on the night. The committee would be delighted if you could come along and support this event and enjoy a social night out with other parents and members of Nenagh Éire Óg. Tickets for the night have been handed out at training and money for the tickets can be returned at next week’s training sessions. This event is open to the public and all are welcome to support the club. Tickets available from committee members also. Our under-14s qualified for the Tipperary Féile final on Saturday last after a great win over Galtee Rovers St. Pecaun in Thurles. Best of luck in the final lads. The club’s weekly walk continues every Tuesday evening at 7pm. There are two options, a 5km and 8km walk. The is also an Easter Sunday walk leaving the complex at 10:30am. Please note this walk has been moved to Easter Monday at the same time. The 5 x €50 lucky dip winners were…. 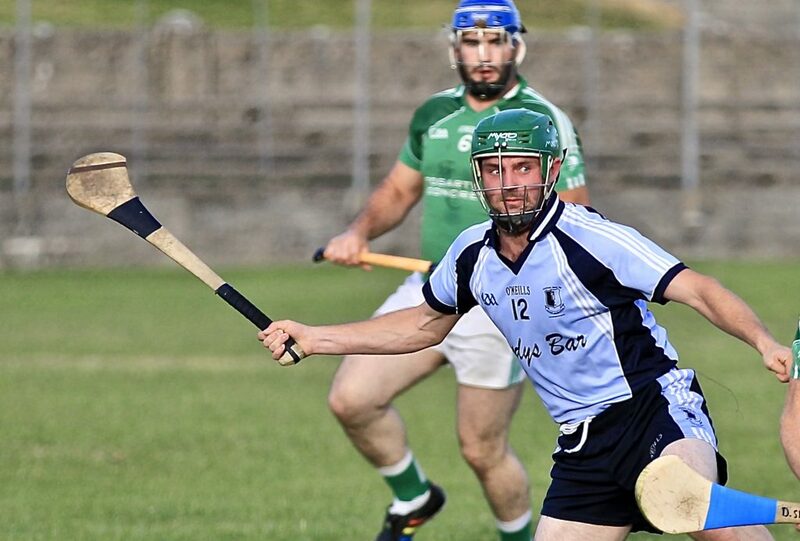 Our senior hurlers recorded a 2-21 to 1-15 win over Upperchurch Drombane in the opening round of the Tipperary Water county championship on Saturday in Dolla. Jake Morris and Tommy Heffernan scored Nenagh’s goals. For a full match report from this game please click here. The lads now play neighbours Burgess at 3pm next Sunday in Dolla in the North Tipperary senior hurling championship. 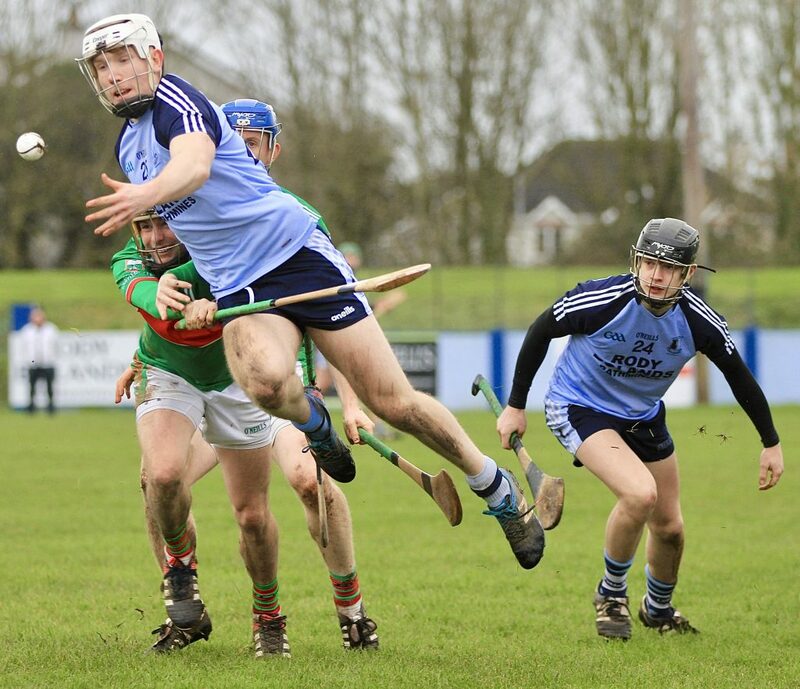 Our minor hurlers were defeated by Borris-Ileigh in the opening round of the North Tipperary minor hurling league on Thursday evening, 1-17 to 1-10. Their next game in this competition is on Wednesday at 19:00 in MacDonagh Park against Kilruane MacDonagh’s. 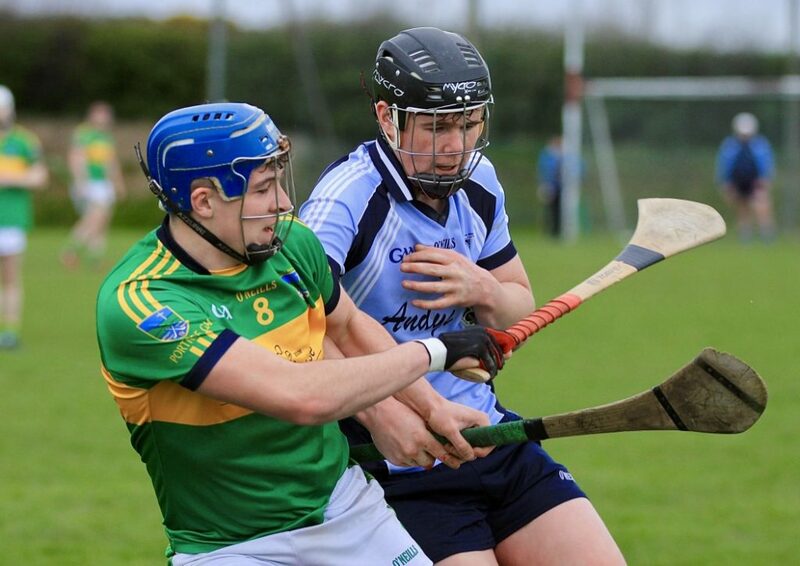 Congratulations to Mark O’Farrell and the University of Limerick fresher hurlers who captured the All-Ireland final on Thursday last defeating Limerick Institute of Technology 3-17 to 1-20. Commiserations go to Adam Healy and Conor McCarthy who were part of the L.I.T. side. Our weekly walks continue this Tuesday at 7pm from MacDonagh Park. There are two options for walkers, a 5km and 8km route and everyone is welcome to take part regardless of fitness levels or if you’re from Nenagh or not. 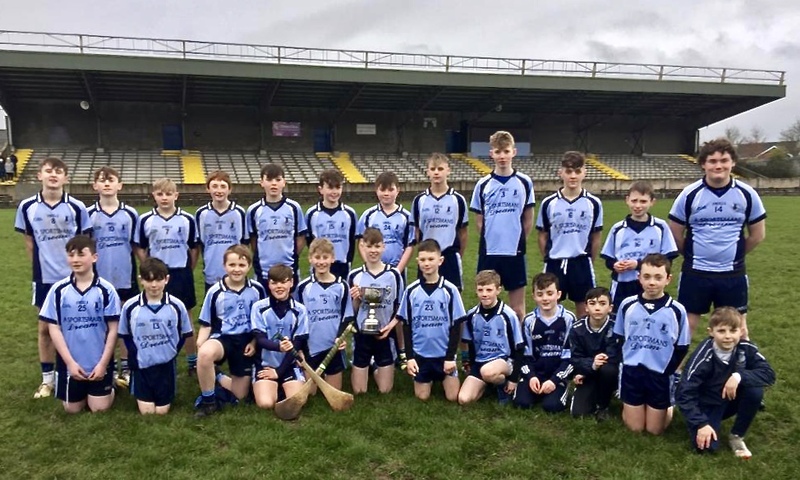 Commiserations go to our under-14 side who were in hard luck in the county Féile na nGael final in Clonoulty over the weekend. They lost out by two-points, 2-8 to 2-6, against a superb Dúrlas Óg side and we wish Dúrlas Óg the very best of luck in the All-Ireland Féile na nGael finals. Hard luck to our Community Games team who put up an excellent show against Toomevara on Sunday evening but unfortunately lost out to a superb Greyhounds side. Best of luck to Toomevara in the remainder of the competition. Our under-6 boys took to the fields for the first time on Saturday morning. What a wonderful turnout. We are all looking forward to the journey this team will take over the next number of years as life-long friendships are made between mentors, parents and players. 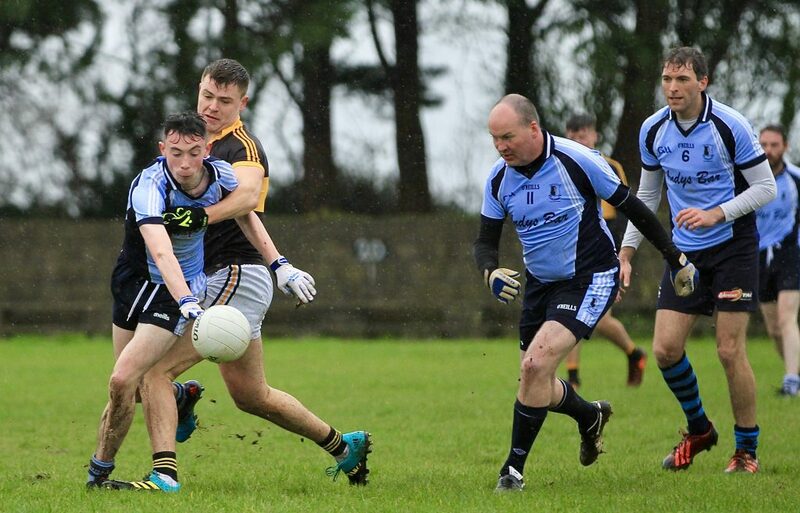 In a good competitive match the senior team lost to Drom & Inch on Sunday by two points. Final score 1-9 to 0-10. Next up is Clonoulty Rossmore in Nenagh next Sunday. The league match scheduled against Burgess did not go ahead on Friday and will be re-fixed soon. Training Monday and Thursday at 6.30. We played our first blitz in Portroe on Saturday where we fielded two teams. Both teams played some excellent camogie, especially the girls who were playing under-12 for the first time. 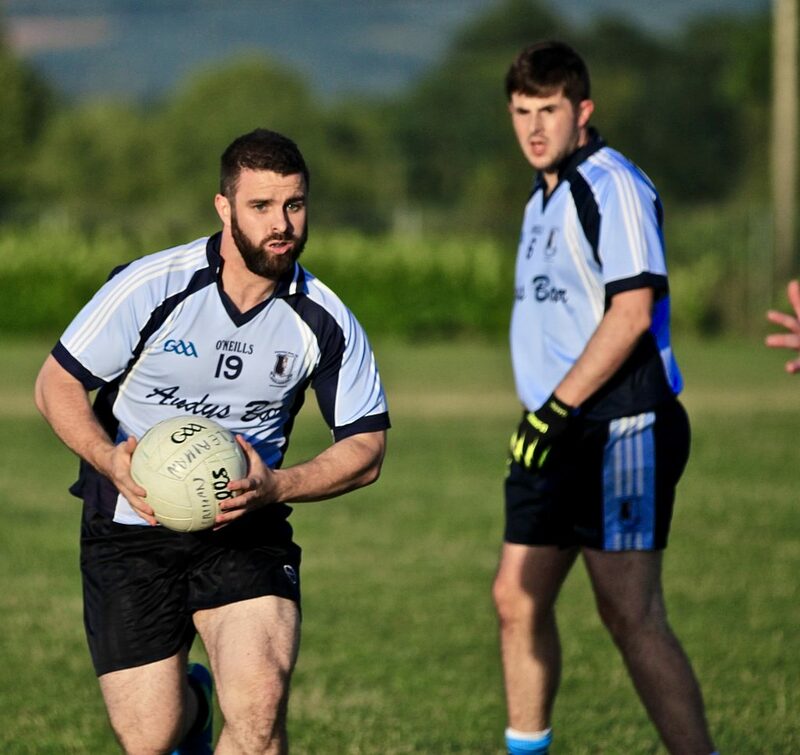 Training continues on Mondays and Thursdays at 5.30pm at Éire Óg pitch. All including beginners are welcome to train. Under-10 training continues every week at 5.30pm on Monday and Thursday evenings. Under-6 and Under-8 training takes place every Thursday 6pm to 7pm. Parents are encouraged to lend a hand. New members welcome. 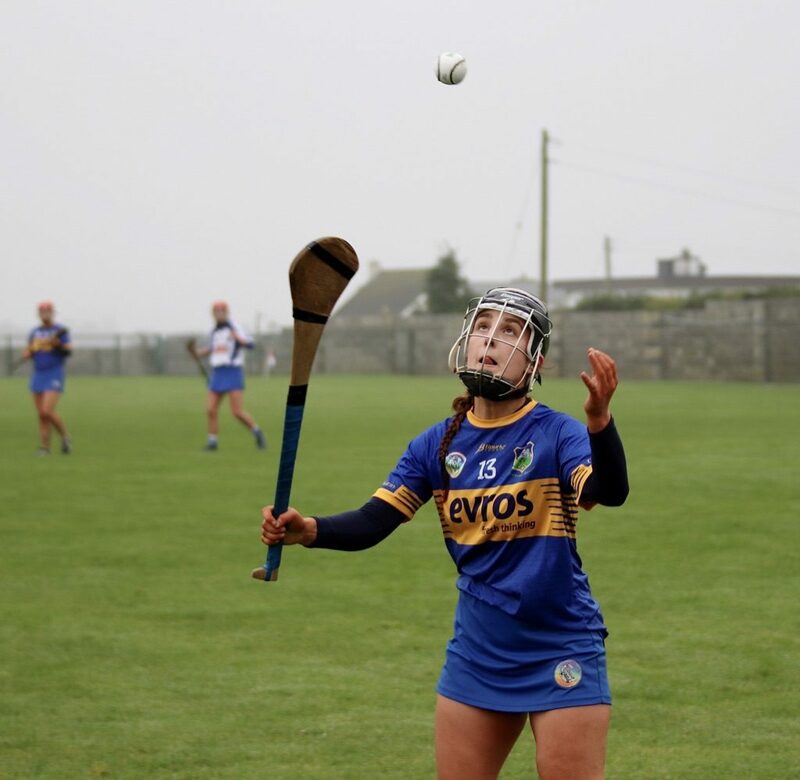 Sarah Quigley from Nenagh started in goal for the Tipperary Intermediate team who won their All-Ireland league semi-final on Sunday against Westmeath on a score of 3-9 to 1-12. Some registrations are still outstanding . Can those who have not yet signed up please do so this week through your team manager. This is important to ensure players are covered from an insurance perspective. 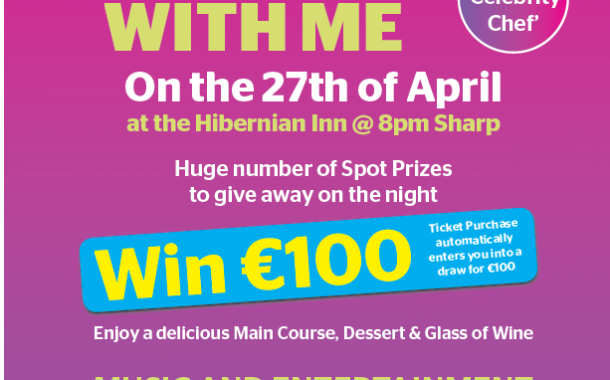 Tickets for the Come Dine With Me fundraising event for the camogie club on the 27th of April in the Hibernian Inn will be distributed to players in the coming days. The committee would be delighted to see a large turnout to support this event on what promises to be a great night at the end of April. 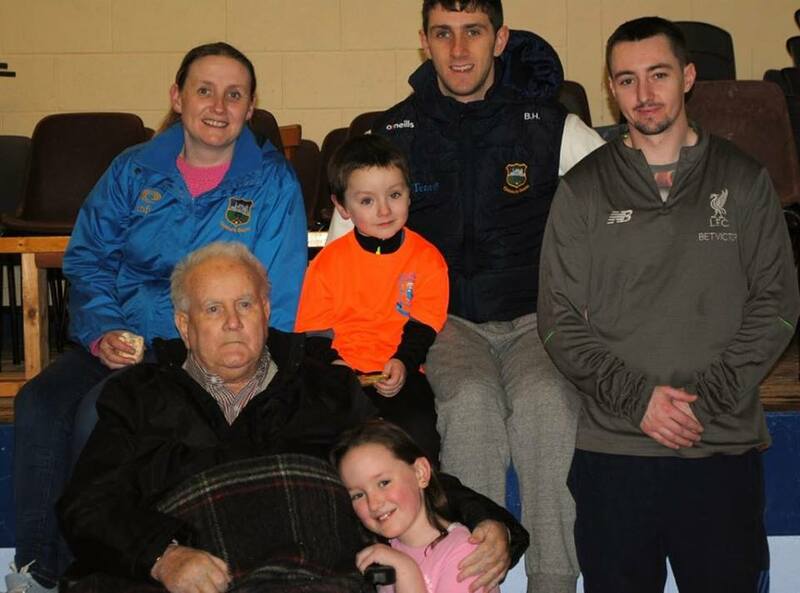 We wish to extend our sympathies to Sharon O’Farrell and family following the recent passing of her father Liam Dalton. 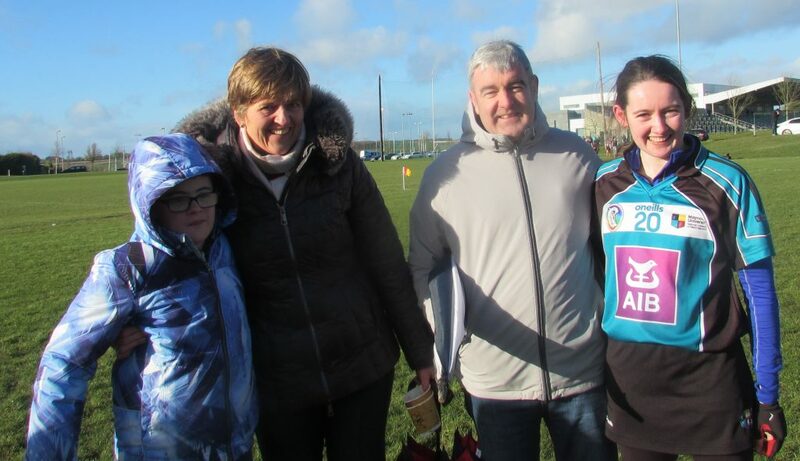 Sharon and her husband Paul have been great supporters of the club while their children are loyal players with Éire Óg. The funeral details are as follows: reposing at Ryder’s Funeral Home, Headford on Tuesday 2nd April from 5pm with removal at 8pm to Church of St Patrick and St Cuana (corner chapel). Requiem Mass at 12 noon on Wednesday, 3rd April. Funeral afterwards to Kilcoona Cemetery. Family flowers only. Donations, if desired, to Galway Hospice. 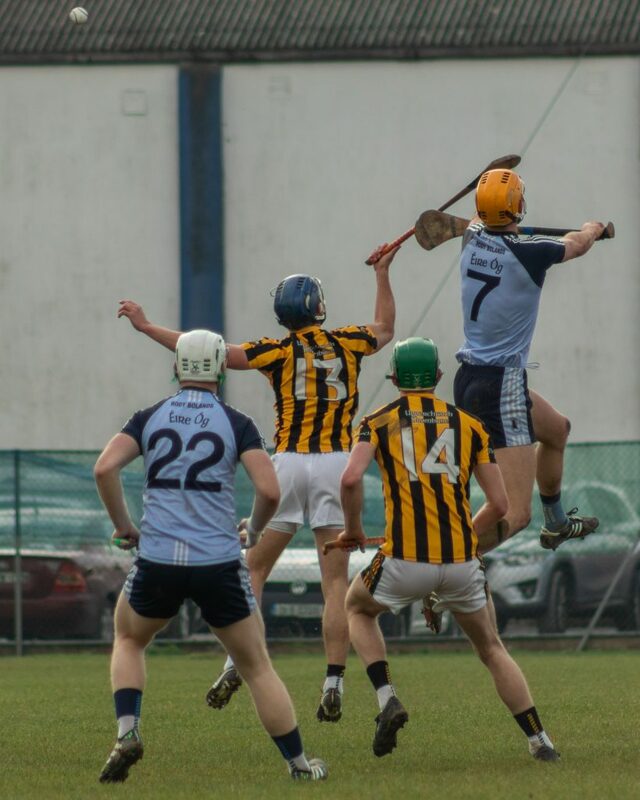 Our senior hurlers begin their 2019 Tipperary Water county championship on Saturday in Dolla at 15:30 when we play Upperchurch Drombane. The team have been training extremely hard for this game and your support would be very much appreciated by all involved. There was disappointment this weekend for all our junior players as all three teams had their fixtures postponed. 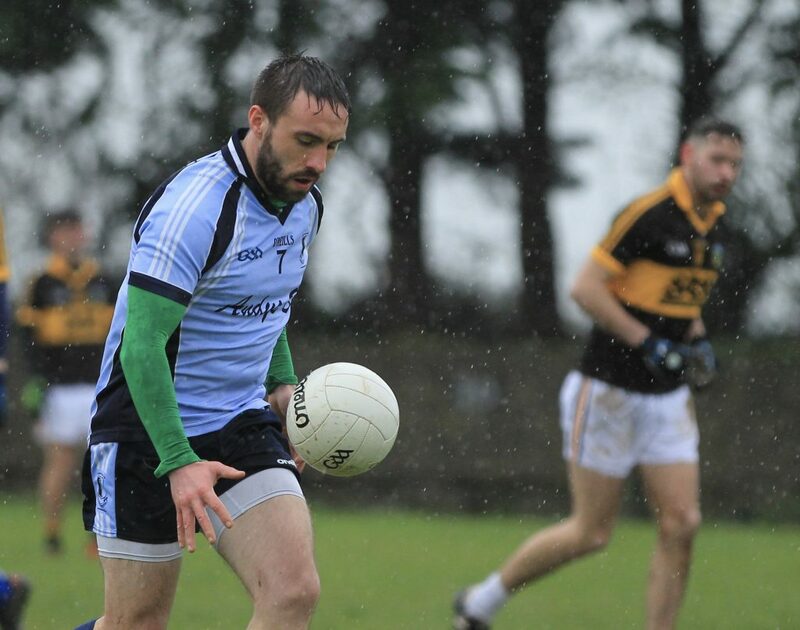 The junior-A side were due to play Burgess, the junior-Bs were down to meet Silvermines while the junior footballers were supposed to play Clerihan. These games will be played at a future date. On Sunday the Senior team drew with the Silvermines in Nenagh, 4-9 to 2-15. It was a tough match and there was a great effort from everyone. Another match is scheduled for next Sunday. For a full range of photographs from this game please click here. The under-16s have a busy week ahead with two matches scheduled. On Tuesday they play Kilruane MacDonagh’s and on Friday Burgess are the opposition to complete the teams group matches. Full attendance needed by all players. 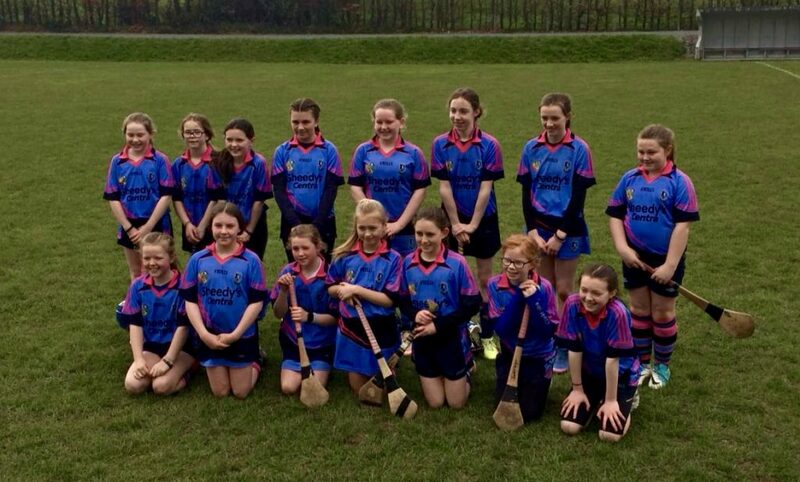 Under-12 camogie returns to the Éire Óg pitch at 5.30pm on Mondays and Thursdays. The first blitz of the year takes place in Kilcolman on Sunday. All players to be at the pitch at 1.10pm. Under-10 girls return to the hurling field this week. Training takes place at 5.30pm every Monday and Thursday. Great to see so many new faces starting up with us lately. Any others girls who wish to join us are always welcome. 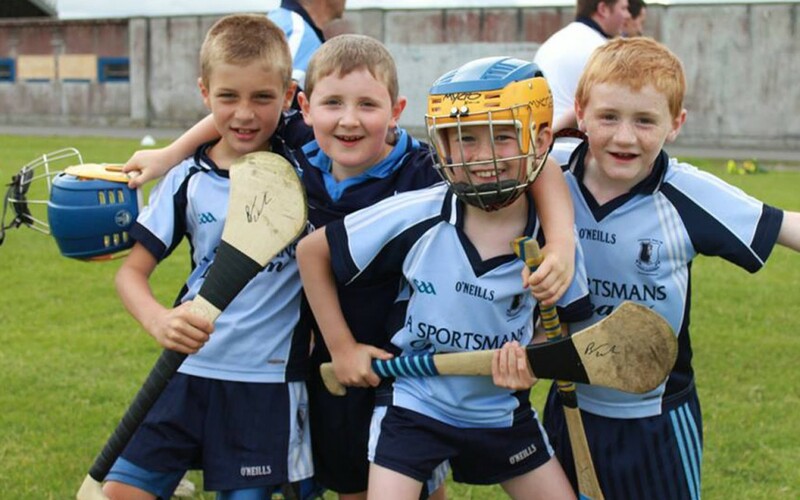 Under-6 and under-8 training is back outside in MacDonagh Park this Thursday from 6-7pm. Girls will need hurleys, helmets, shin pads and studded boots to prevent slipping. Parents must stay with children and extra help will be needed putting out/tidying up gear and getting the bibs and helmets on. New members are welcome to come and join in. Any outstanding club membership forms need to be handed back to team trainer this week. This is the final reminder and registration is essential for insurance purposes. 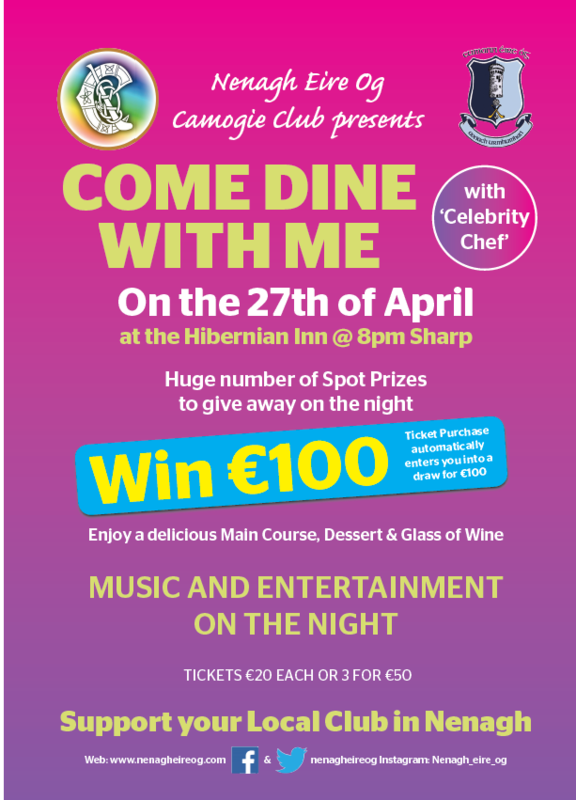 The camogie club will be hosting a ‘Come Dine With Me’ evening at The Hibernian Inn (Hi-B) in Nenagh as a fundraiser for the club on the 27th of April. It promises to be an entertaining evening with a ‘celebrity chef!’ lined up. Details and tickets to follow shortly so save the date! The under-8 hurlers made a welcome return to training this week and they will be getting together every Saturday morning from 10am. New players are more than welcome. 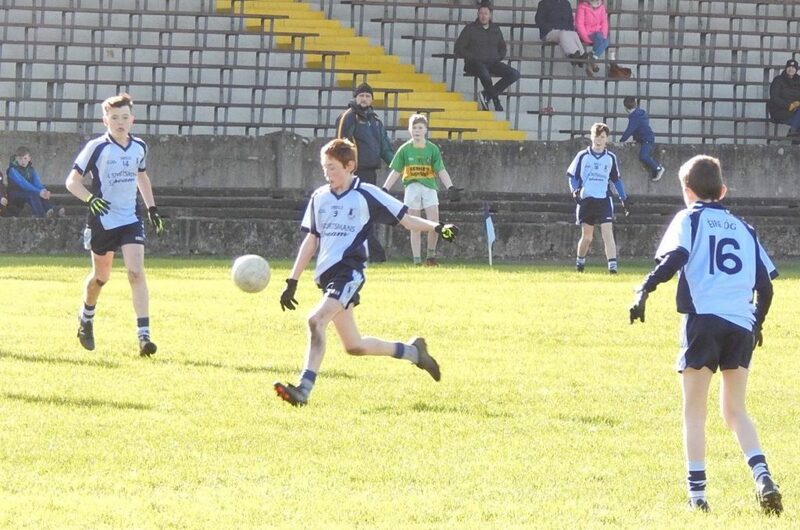 Our under-12 A footballers had a fantastic win over Inane Rovers 2-8 to 3-4 in MacDonagh Park on Saturday. For a full range of photographs please click here. The under-12 C side played a highly entertaining match against Newport and unfortunately lost out by one point, 2-2 to 2-1. Photographs from this game can be accessed here. Best of luck to our under-14 hurlers in the county Féile na nGael semi-final tomorrow evening, Monday, against Cashel King Cormacs in Borrisoleigh at 7pm. All support welcome. 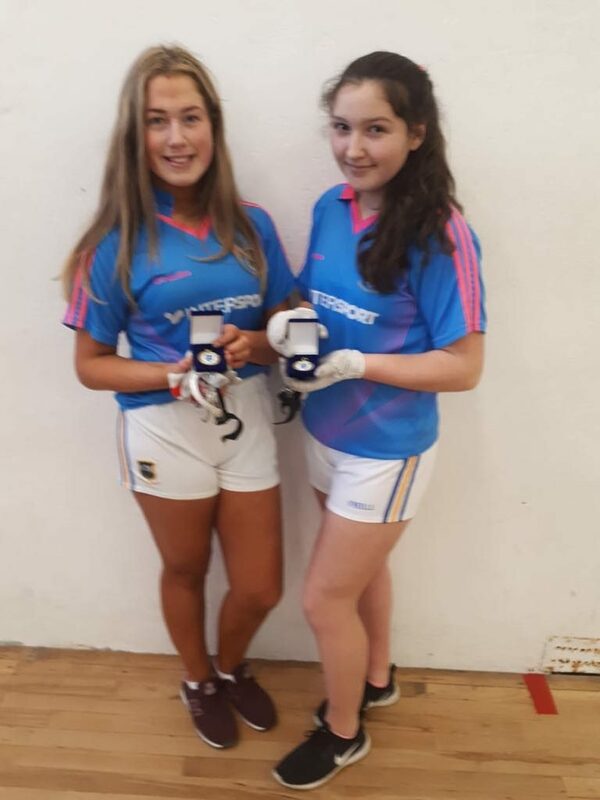 Well done to Avril Dooley and Ciara Morris who won the Munster under-15 D development tournament this morning. 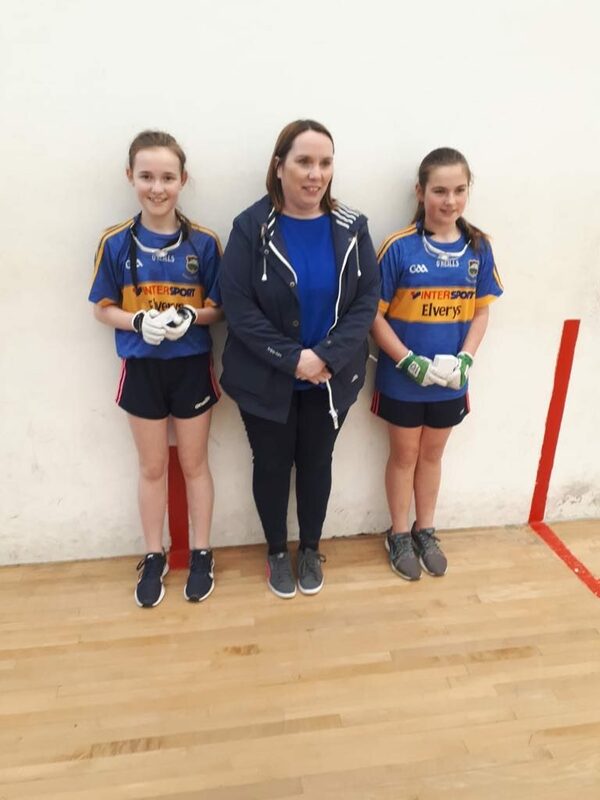 Congratulations also to Casandra Jones and Danielle Kyne (Youghalarra) who won the under-13 D Munster development tournament. Hard luck to Billy O Brien who lost the final in under-12 singles and Emmett Jones and Stephen McNamara who lost the final in under-12 doubles. Nenagh Handball Club congratulate everyone who represented Tipperary this morning. 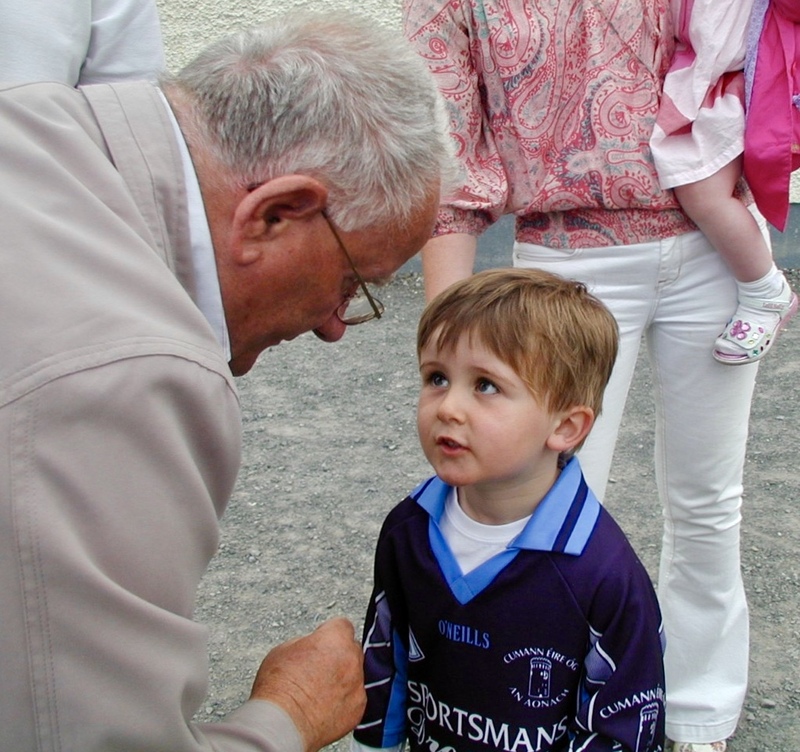 The 5 x 50 lucky dip winners were…..
We received this absolutely fantastic photograph during the week of the late Tommy Mulcahy passing on his knowledge to an eager and young Sam O’Farrell. Tommy has gifted so many young people his knowledge, wisdom and love of Gaelic games and has helped ensure our sports will continue to prosper with the next generation. 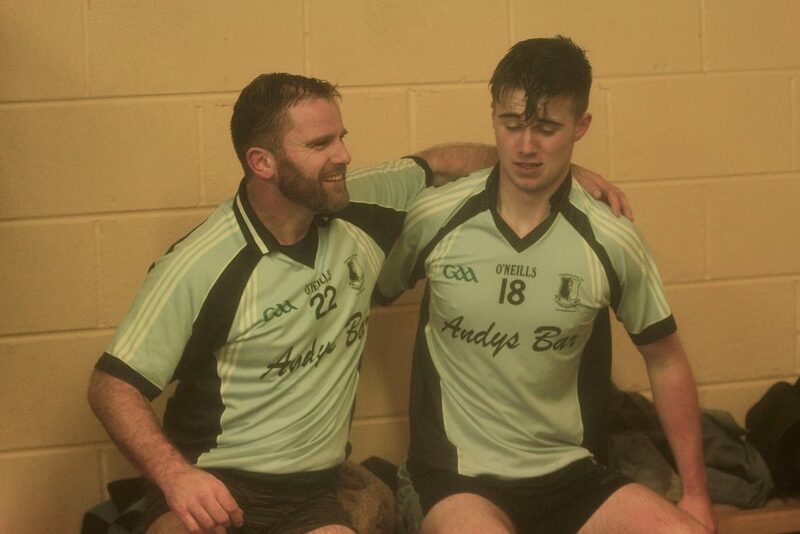 Tommy obviously told Sam something special here as he is developing into a fine hurler and Gaelic footballer. It was with great sadness that we learned of the passing of one of our all-time great clubmen in Tommy Mulcahy early on Saturday morning. 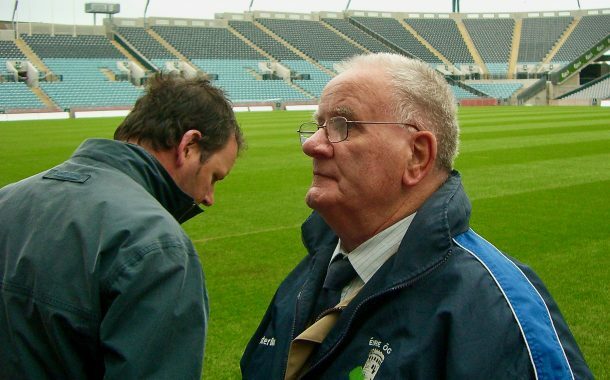 Tommy was everything a GAA volunteer should be: a coach, a mentor, a friend and someone who wasn’t afraid to put his shoulder to the wheel when a job needed to be done. His influence on so many Éire Óg hurlers, footballers and camogie players cannot be over stated. Hundreds of players have benefitted from his knowledge of Gaelic games over the years as he coached and managed numerous juvenile, adult and camogie teams. He gave a lifetime of service to the GAA at club, divisional and county level. 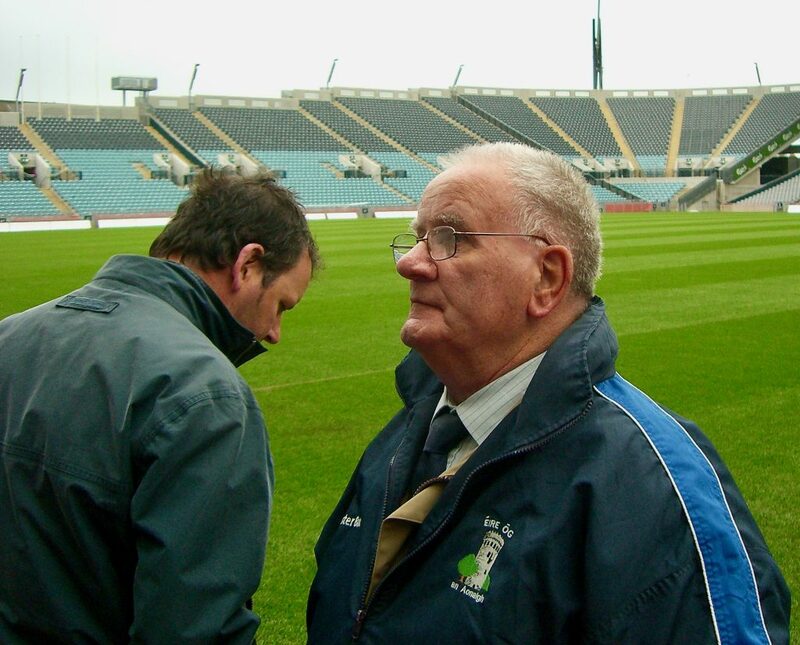 He held every administrative role with Nenagh Éire Óg throughout his life. He served as chairman and secretary of St. Mary’s Handball Club and held many positions at divisional Bord na nÓg level. An accomplished referee, he took charge of many underage and adult matches in both hurling and Gaelic football. 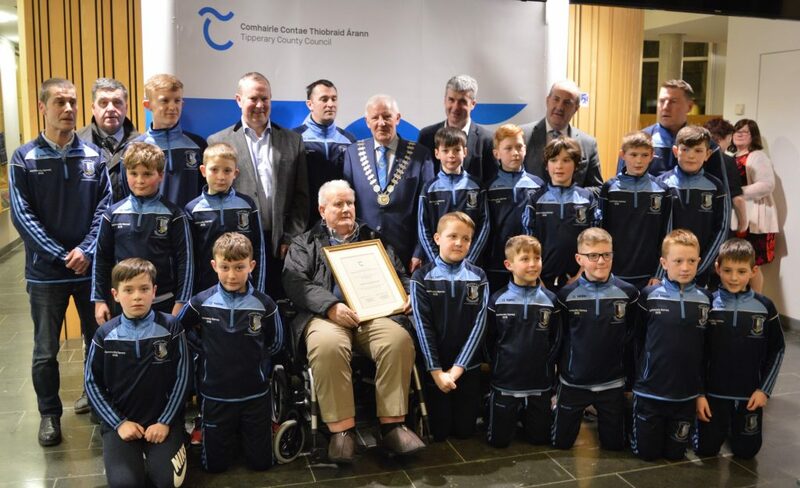 One of his proudest moments came last summer when the All-Ireland winning Community Games team made a surprise visit to thank him for all the work he did with them when they first started playing hurling. The influence of Tommy on Nenagh Éire Óg and the town in general simply cannot be measured. A real character there is no doubt that we will never see his likes again. 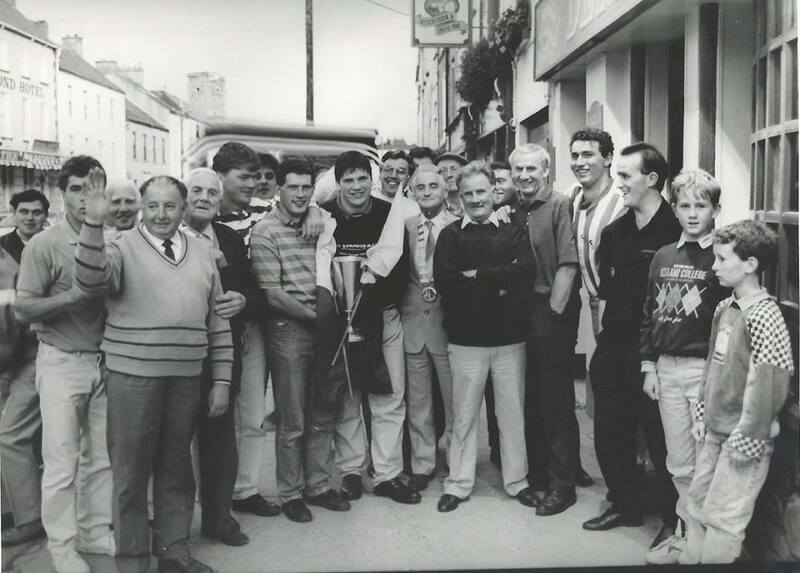 In the photograph below he is standing proud, front and centre with the North Tipperary winning team of 1992 who ended a long famine and brought the Frank McGrath Cup back to the town. On behalf of everyone in the club we extend our sincerest sympathies to his family, friends and all who knew him. 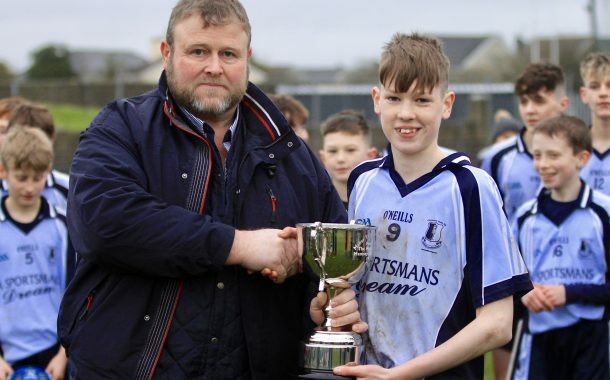 We extend our congratulations to Mark Carey and Borrisokane CC who captured the Masita GAA Post Primary Schools’ Michael Cusack Cup final on Saturday when they defeated Colaiste na Coiribhe in Duggan Park, Ballinasloe 1-22 to 1-12. This is a fantastic achievement for all involved and helps demonstrate the strength of underage hurling in North Tipperary. Following last week’s loss to Loughmore Castleiney the senior hurlers got their league campaign back on track with a 2-18 to 1-10 win over Clonoulty Rossmore under lights on Friday evening in Clonoulty. Goals from Paddy Murphy and Tommy Heffernan helped propel the Blues to a fine win. 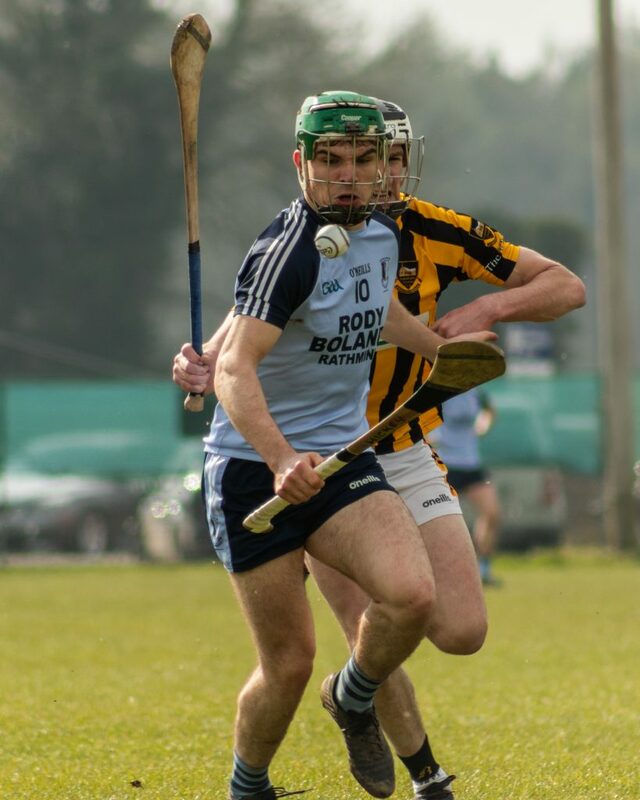 Our junior-A hurlers defeated Toomevara 1-18 to 2-8 in the opening round of the North Tipperary league on Sunday afternoon with Adam Healy having a fine game helping himself to a personal tally of 1-3. Our junior-B hurlers were comprehensively beaten by Portroe in the opening round of the league on Saturday, 3-23 to 0-4. We wish Thomas O’Brien and Liam Heffernan speedy recoveries from knocks they picked up in the game. Our junior footballers are back in league action next Sunday afternoon when Clerihan will visit MacDonagh Park for a 3pm throw in. 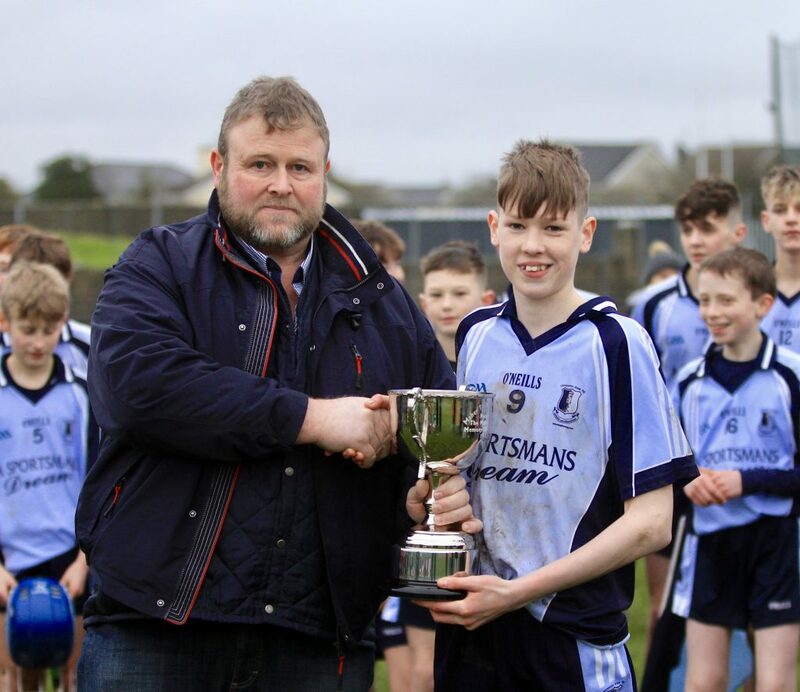 Saturday was a very emotional day for the club and in particular for our under-14s footballers who learned of the passing of their very first coach Tommy Mulcahy prior to their North final against Ballina. 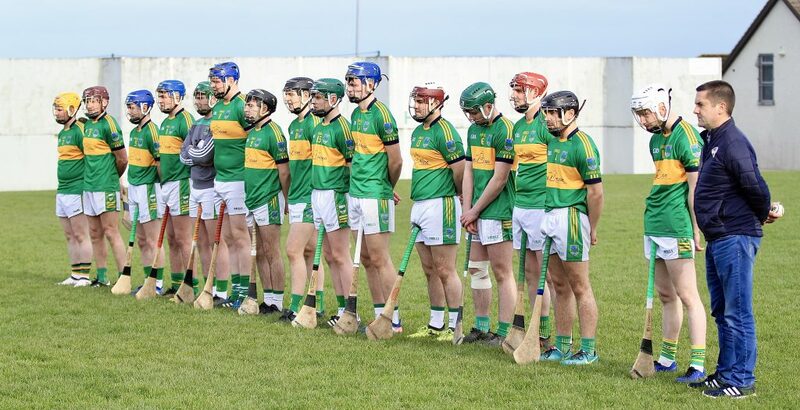 Both teams stood for a very emotional, poignant and respectful minute’s silence and the young Éire Óg men paid the ultimate tribute they possibly could to Tommy by capturing the Féile Peil title with panache and style adding to the to their Féile hurling title won on Monday last. The double within a week! Our thanks go to a gallant Ballina team, referee Gareth Howard and his umpires and North BNG secretary Philip Delaney, who gave a touching speech about his memories from juvenile playing days of Tommy always being the first to greet teams at the dressing rooms. Team captain Sam O’Farrell, gave a wonderful speech and dedicated the win and trophy to his teams first coach Tommy. Well done to our boys. They are a credit to club and families. Goalkeeper Josh McLoughlin clears under pressure after making an excellent save. Our juvenile club held a very successful table quiz on Friday evening last in the Dapp Inn. 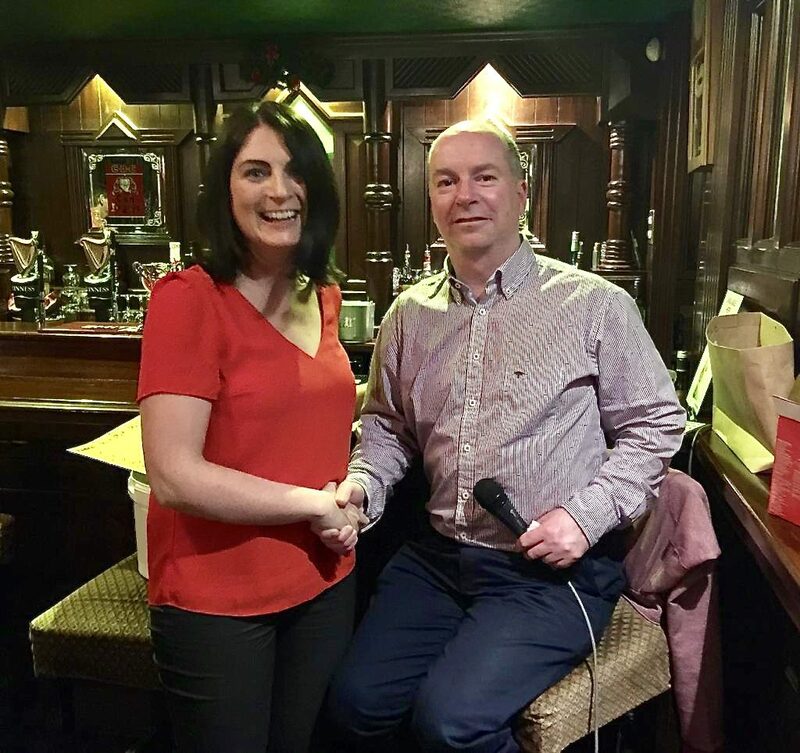 We wish to thank all who supported it along with quiz master extraordinaire Mel Gleeson, our sponsors, the staff in the Dapp Inn and all our organisers. Senior: The senior team have league fixtures for the next three weekends. More details to follow during the week. There’s been a great effort from all of the players and it’s important to keep all the good work going. 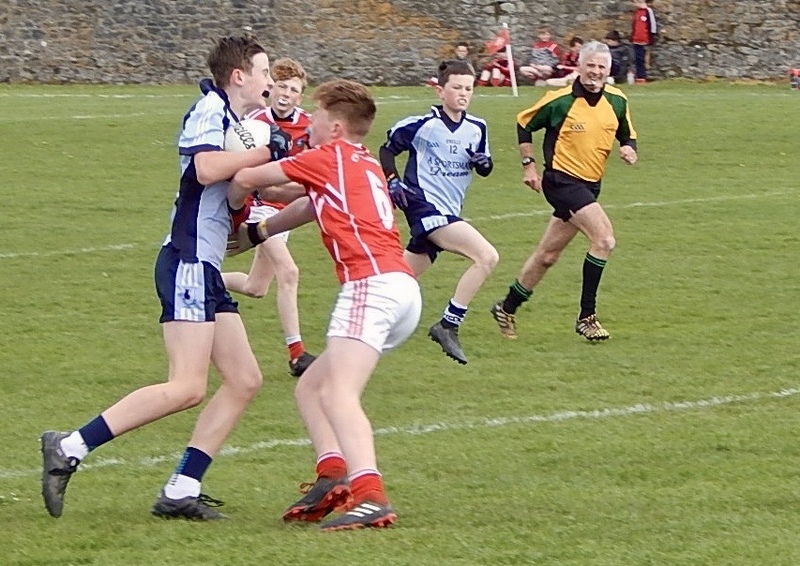 Under-16: After last Monday’s one-point loss to Portroe, Nenagh under-16s emerged one-point winners over Kiladangan on Saturday in another cracking game. A super hardworking effort from all of the players was on display. Under-12: Under-12 training will continue in Nenagh College from 7pm-8pm on Wednesday evenings. 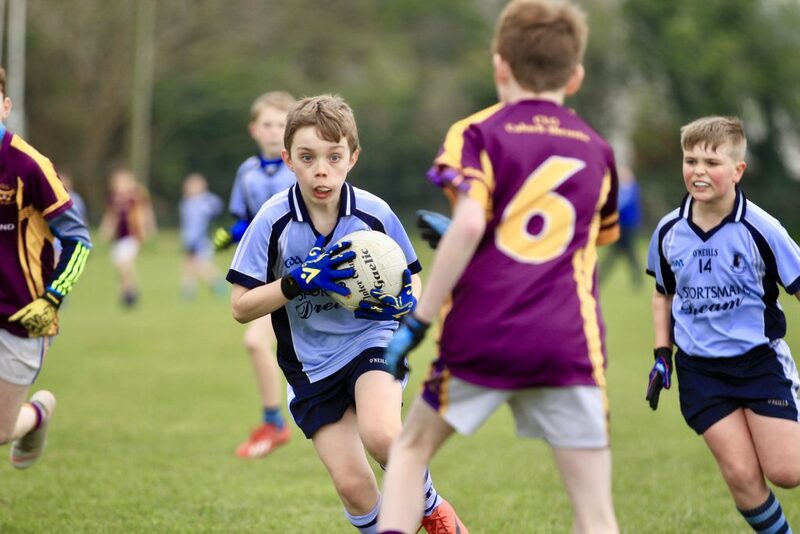 The first under-12 cluster blitz will commence on the 6th April at 11am in Kilcoleman. Under-6s & Under-8s: The under-6s and under-8s continue their indoor training in St.Mary’s Secondary School Hall each Thursday from 5.45pm to 6.45pm. New faces always welcome. Club Registration: All registrations forms must be back to team manager at training this week. This is a requirement for insurance purposes. 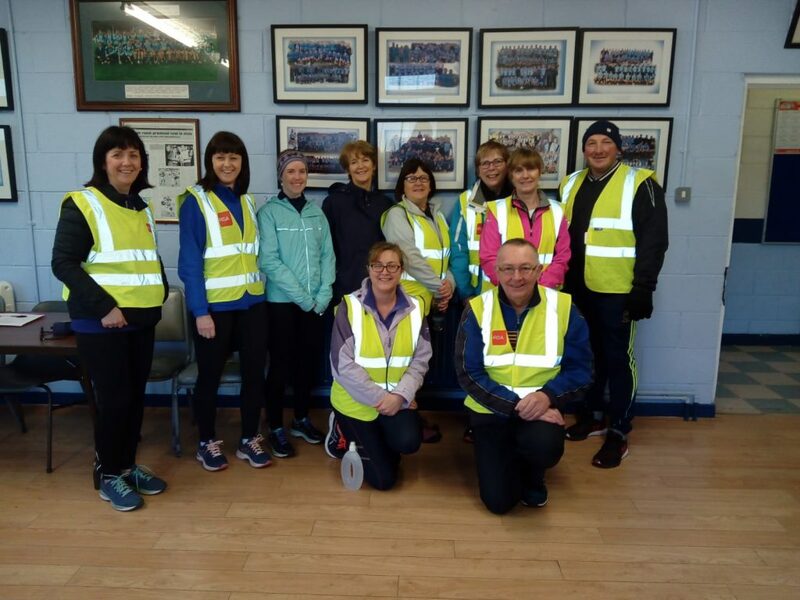 Flag Day: Nenagh Éire Óg Camogie committee would like to express their thanks to all of the trainers and parents involved in organising the flag day rotas and for giving up their time to assist with the collection in Nenagh on Saturday. Thanks to everyone who supported the club on the day. We wish to thank Ballina, Portroe and Toomevara for kindly allowing us to pay our respects to Tommy Mulcahy this weekend. 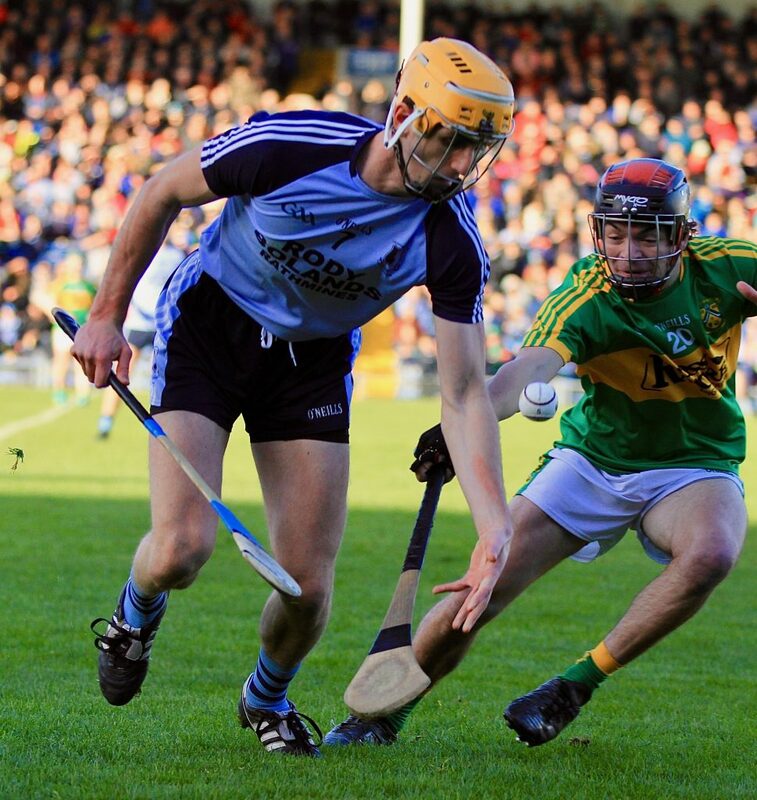 Hard luck to Jake Morris, Barry Heffernan and the Tipperary hurlers who were defeated by Dublin the Allianz league quarter final on Saturday evening in Semple Stadium. Jake had a smashing game scoring three points. The lads must bed down now and get ready for the Munster championship. Our junior A and B hurlers open their respective league campaigns next weekend with the As playing Toomevara and the Bs lining out against Portroe. Best of luck to both sides and details of these games will be published on our website once they are confirmed. Our seniors were supposed to play Clonoulty Rossmore on Tuesday evening last but the game fell fowl of the weather. Please keep an eye on social media for details of the re fixture. 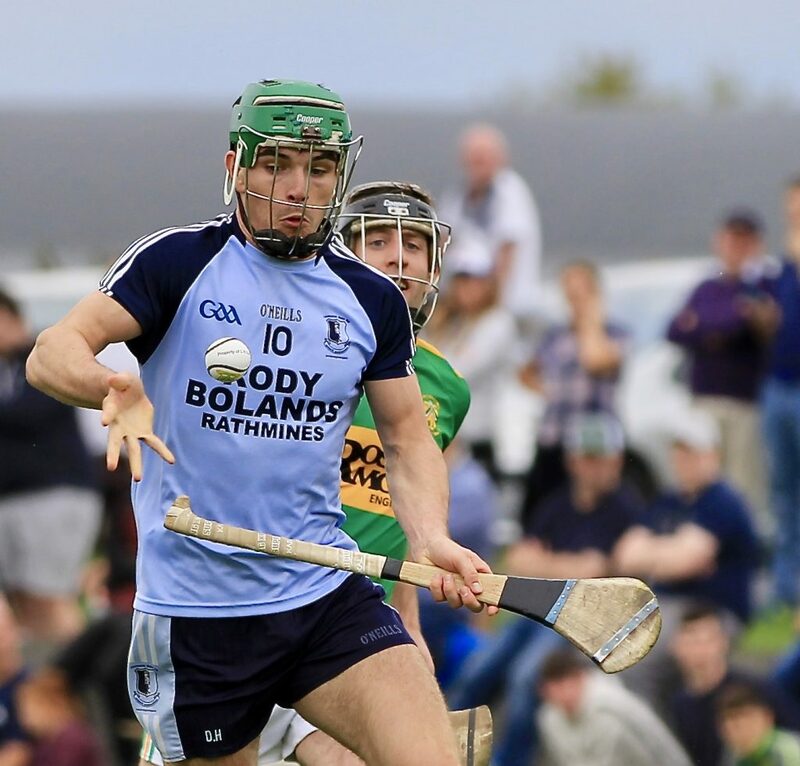 We played out opening game of the Tipperary Water sponsored league on Bank Holiday Monday and Nenagh started brightly in this encounter and by the seventh minute they led 1-3 to 0-1 buoyed by a MIchael Heffernan goal after great work by Paddy Murphy. They maintained their advantage and went into the half-time break leading 1-7 to 0-7. Loughmore worked their way into the game throughout the second period and in the 36th minute Shane Hennessy struck a fine line ball under the stand side of the field and a brilliant Anthony Ryan connection saw the ball fly into the Nenagh net. Nenagh suffered a further blow minutes later when Barry Heffernan was dismissed after picking up his second yellow card of the game. 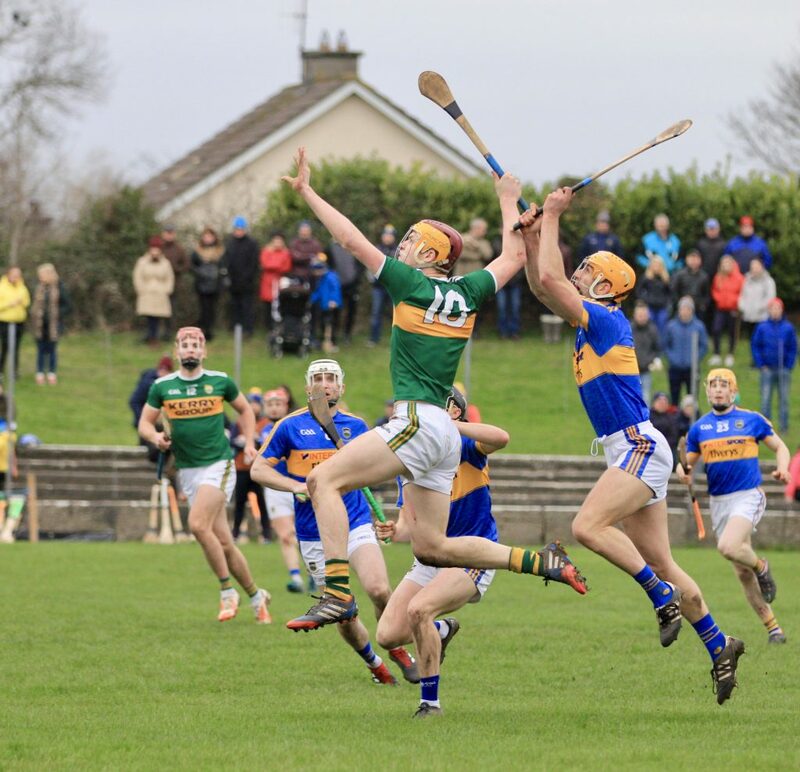 Loughmore took full advantage of the spare man with Brian McGrath mopping up numerous Nenagh attacks as the Mid men held out for a deserved three-point victory. There was a huge number of players marching in the St Patrick’s Day parade. It was lovely to see so many boys and girls wearing the Éire Óg colours. Thanks to all the parents for joining in and helping out. A special word of thanks to Catherine McTiernan from the juvenile club for organising and bagging over 120 goodie bags for the children who took part in the parade. One of our under-6 girls, Laura Walsh, presented a sliotar to Councillor Hughie McGrath at the viewing stand on behalf of the club. More league matches will take place over the next few weeks. Training as usual on Sunday mornings. Membership forms to be returned this week from players for insurance purposes. 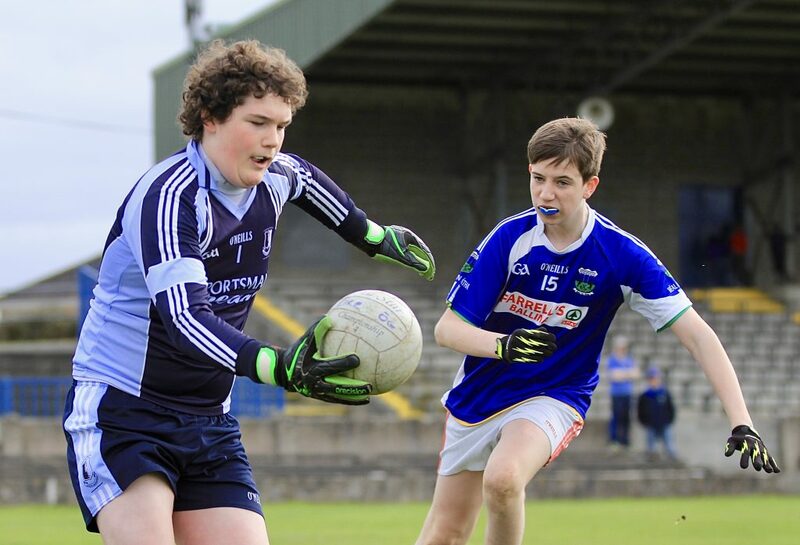 Under-12s training will continue in Nenagh College from 7 to 8pm on Wednesday evenings. The first under-12 Cluster Blitz will commence on the 6th April at 11:00am in Kilcolman. 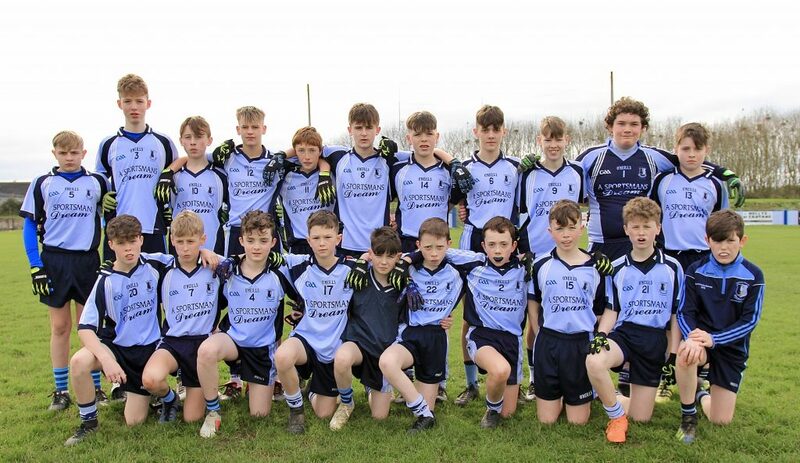 Congratulations to our Féile na nGael side who defeated Toomevara on Monday afternoon in the North Tipperary Feile final in MacDonagh Park, 6-13 to 1-6. 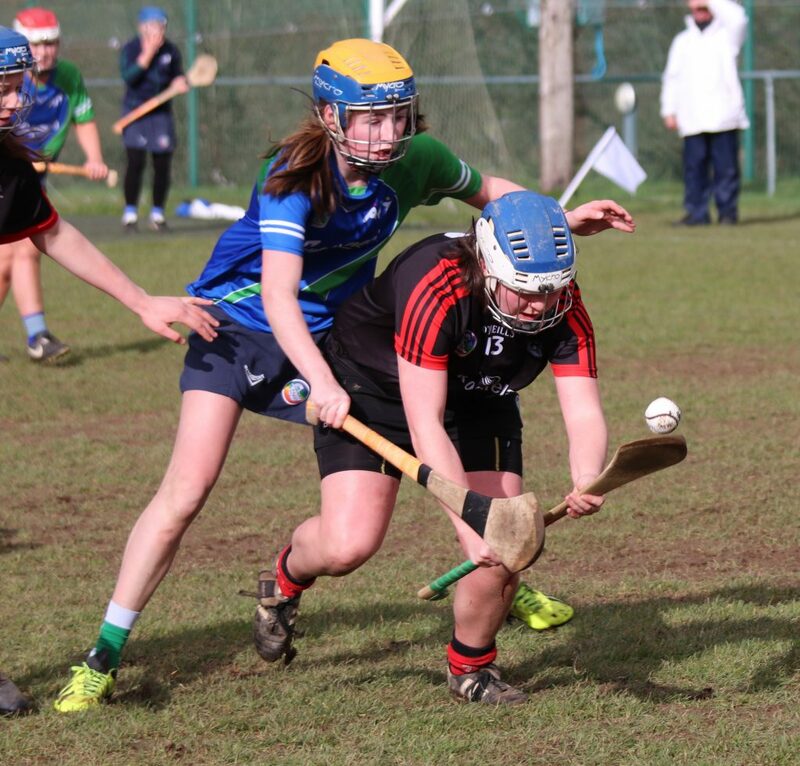 Toomevara were fantastic opponents and there is no doubt that they did not deserve to lose by such a margin. The Éire Óg Juvenile Club are holding our annual Table Quiz at The Dapp Inn on Friday, 22nd March at 9pm. Gather a posse, draw lots for the babysitting duties and come along to this social evening for some brain-teasing, a bit of fun but most of all, a great time. Parents of our newest and youngest members especially welcome. 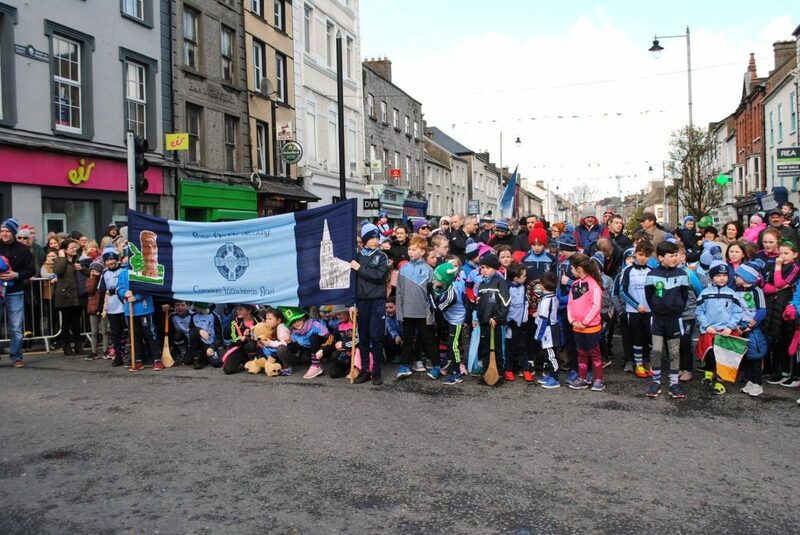 There was an incredible show of support for Nenagh Éire Óg hurling and camogie clubs yesterday at the parade. Many thanks to all the parents and players who represented their club with pride. This year’s parade was a great opportunity to highlight all the successes of the past year. Beannachtaí na Féile Pádraig oraibh go léir. There was no winner of this week’s lotto draw. John O Donoghue, Carrig Rua. On Friday last the world celebrated International Women’s Day 2019 and while we know we are a few days late to the party we do hope all the ladies involved in our club, be they administrators, coaches, parents, supporters or players had a happy International Women’s Day. 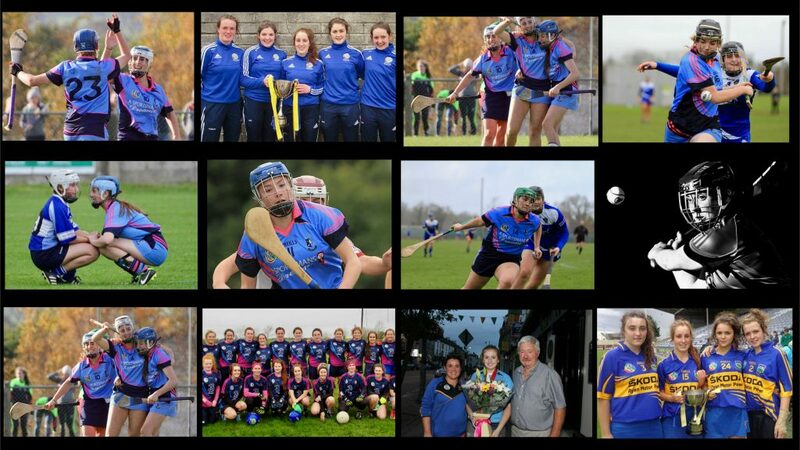 We’re very fortunate to have a thriving camogie section which continues to grow year on year while our handball club is producing some of the best emerging female talent in both Ireland and the world. The 20X20 initiative, a new campaign presented by the Federation of Irish Sport and originated and developed by the creative agency Along Came A Spider and supported by Healthy Ireland, is setting out to create a measurable cultural shift in our perception of women’s sport so that it will be seen as something strong, valuable and worth celebrating. Numerous Irish sporting organisations including the GAA are calling on the people of Ireland and all those involved in Irish sport and physical activity to get behind female sport in a concerted effort to increase media coverage, boost attendances and ultimately, grow involvement in female sport and physical activity by 20% by the end of 2020. The general public are being asked to pledge one action to show their support by doing anything that can accelerate progress for women’s sport in Ireland and we here in the club encourage all our members to get involved. You could make it your business to come and watch our camogie or female handballers in action and see the amazing talent and skills they possess. If you have never seen these players in action you could pledge to come to just one match and we guarantee that you’ll not be disappointed. For more information on this brilliant initiative please click here. 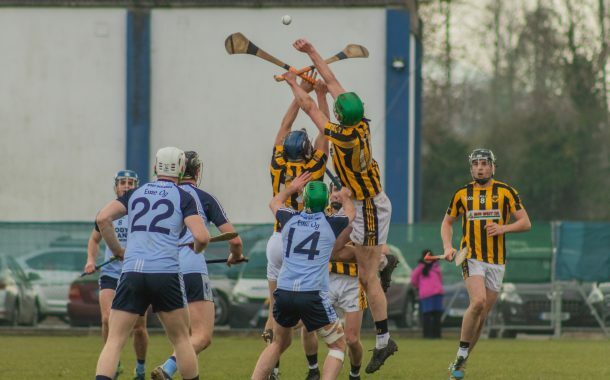 Our senior hurlers were due to play Clonoulty Rossmore in the opening round of the county league on Friday evening last but the game was postponed and is re-fixed for this Tuesday evening, 12 March, in Clonoulty with an 8pm throw-in time. Best of luck to the lads as they begin their 2019 campaign. Our second game in the league is fixed for Bank Holiday Monday, 18 March, in MacDonagh Park when Loughmore Castliney will be in opposition. This game starts at 11:30am. 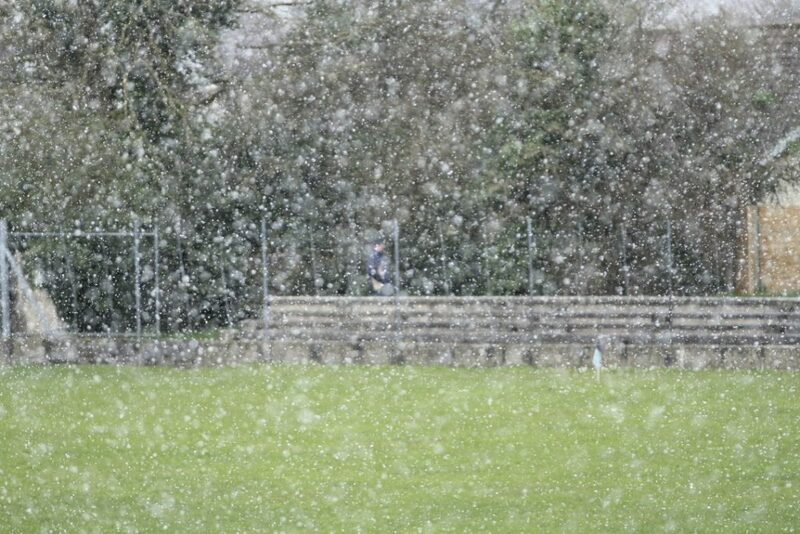 Our minor footballers played Kilruane MacDonagh’s in a frightfully freezing MacDonagh Park on Sunday morning in the North minor championship and despite the weather conditions that provided us with everything from snow to hailstones to brilliant sunshine, both sides played out a highly entertaining encounter with Kilruane winning out 3-4 to 0-6. For a full series of photographs from the game please click here. There will be a social walk at 10am on St. Patrick’s Day leaving from MacDonagh Park. This walk is open to all members of our community and beyond, is a great social activity and way to get fit. All are welcome regardless of fitness. As a result of the yellow weather warning the senior match against Cashel was deferred. Training as usual next Sunday. The under-16s will play Portroe next weekend. Training next Tuesday and Thursday as normal. Training continues in Nenagh College from 7pm. to 8pm on Wednesday evening. Under-6s and under-8s continue their indoor training in St. Mary’s Secondary School Hall each Thursday from 5:45pm. to 6:45pm. New faces always welcome. All registrations forms must be back to team manager at training this week. This is a requirement for insurance purposes. 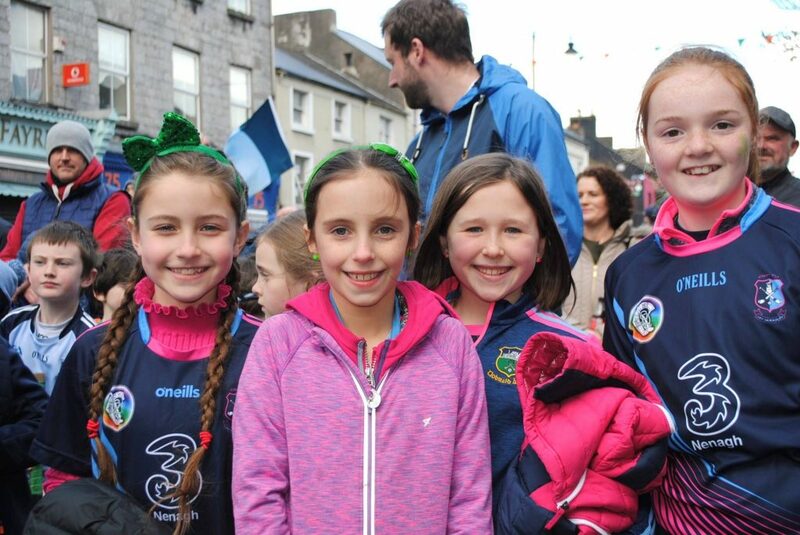 The hurling & camogie club will take part in the St Patrick’s Day parade in Nenagh next weekend as usual. We hope to see as many players as possible taking part wearing their club colours. 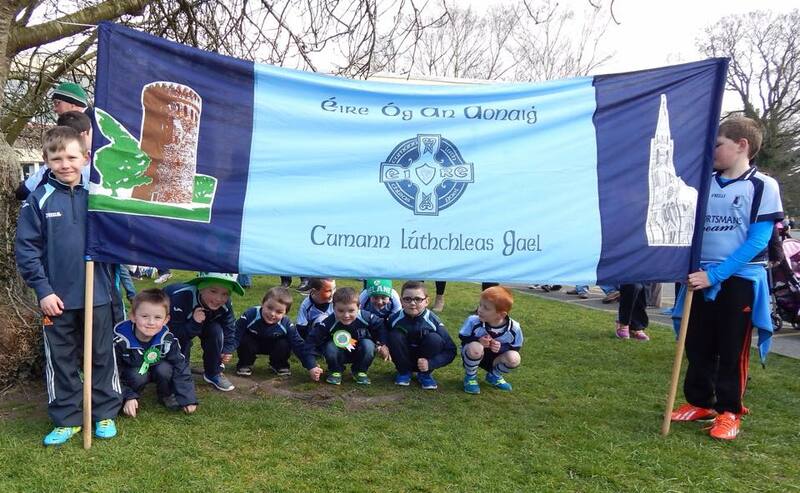 Calling on all of our juvenile boys to keep the tradition going and walk behind our banner on St. Patrick’s Day. The ‘Beast from the East’ didn’t stop our lads last year, so to celebrate the 10th Anniversary of the re-formation of the Nenagh St. Patrick’s Day parade, we are looking for a big turn-out in 2019. We will meet at 13.45pm at the C.B.S. Primary gates on Summerhill and the boys are to be collected immediately following their march at the railway station car park, (that’s where the goodie bags will be!) More information from mentors soon. 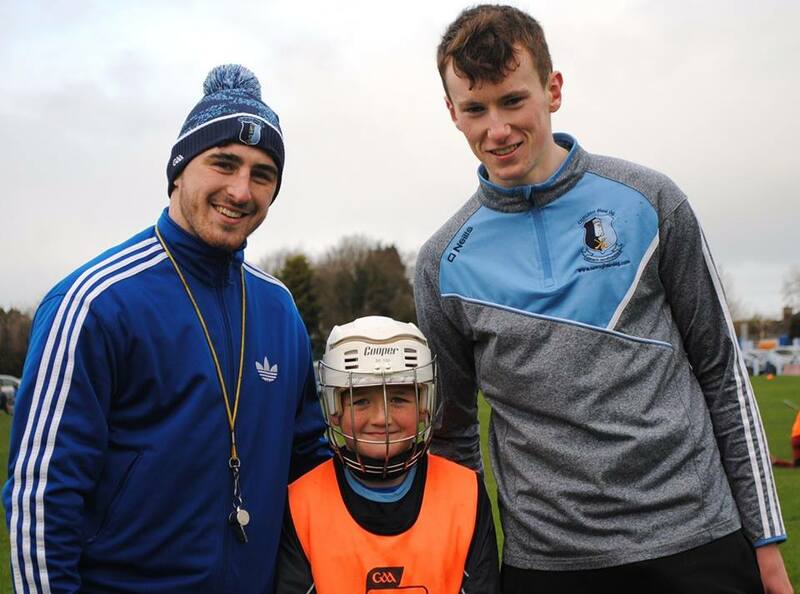 Andrew Coffey and Killian Malone coaching a young fan on Saturday morning. On Saturday morning the underage hurling teams took to the field and availed of an opportunity to be coached by our senior players. The under-8, under-10, under-12, under-14 and under-16 players enjoyed the training sessions provided by our senior players, whom they all look up to. Not even the driving rain that fell at times prevented the players from making the most of this experience. The hot food served in the hall afterwards was really appreciated and helped to warm everyone up. Our thanks to Danielle from the Hibernian Inn for feeding well over 100 hungry boys and to Eileen Ryan for all her wonderful work catering in the hall also. Our under-6s trained as usual indoors also and enjoyed lots of treats afterwards. It was great to see the full juvenile club all in the field training at the same time. While the players were outside, parents and coaches involved in Éire Óg benefited from a talk given by Niall Corcoran. Niall is a former Dublin senior hurler and is games development officer with Kilmacud Crokes and gave a great insight into club development. 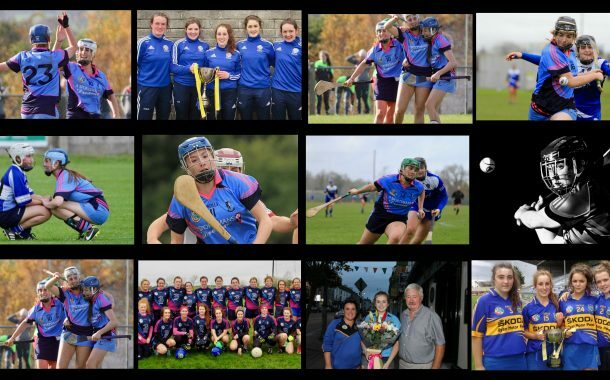 For a fantastic range of photographs put together by juvenile PRO Darragh Quinn please click here. Membership is due. Please return forms to team mentors or any committee member. Contact 086 0855165 if you have any queries. 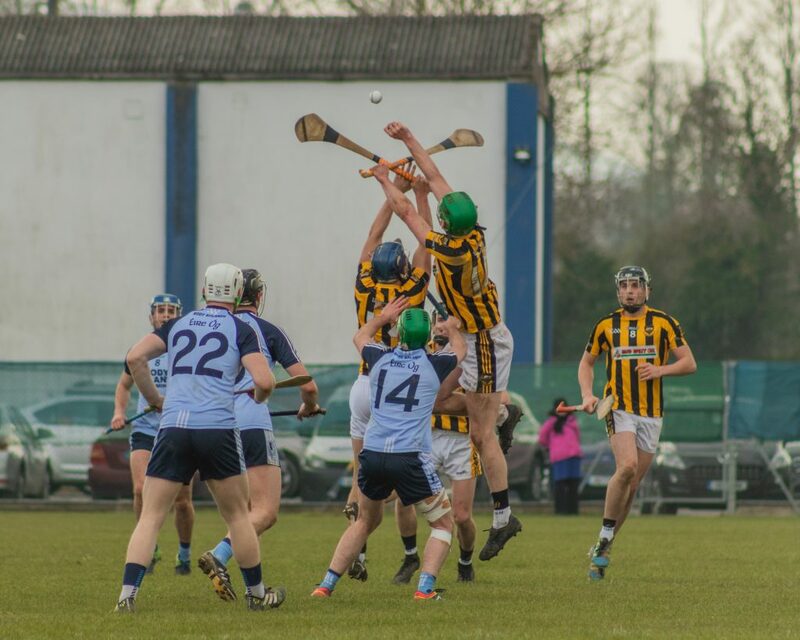 This Wednesday at 15:45pm in Mary Immaculate College, Limerick Institute of Technology play University of Limerick in the All-Ireland freshers hurling final and Nenagh Éire Óg have three players involved. Lining out for LIT are Conor McCarthy and Adam Healy while Mark O’Farrell plays for UL. We wish all three lads the very best of luck. 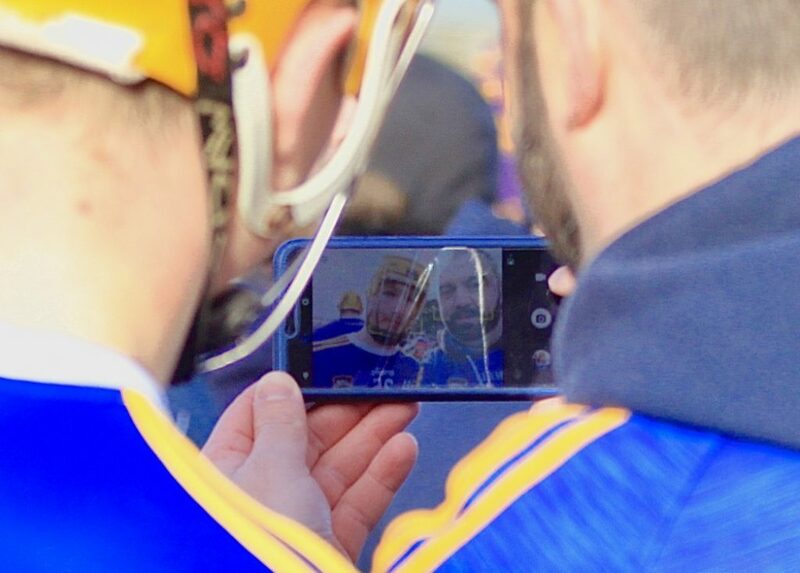 Well done to Jake Morris, Barry Heffernan and the Tipperary senior hurlers who recorded a comfortable 1-29 to 1-16 win over Cork today in the league. Jake scored two points while Barry came on as a second-half substitute. They now play Dublin next weekend in the quarter final. We’ve all heard and played the game Where’s Wally? 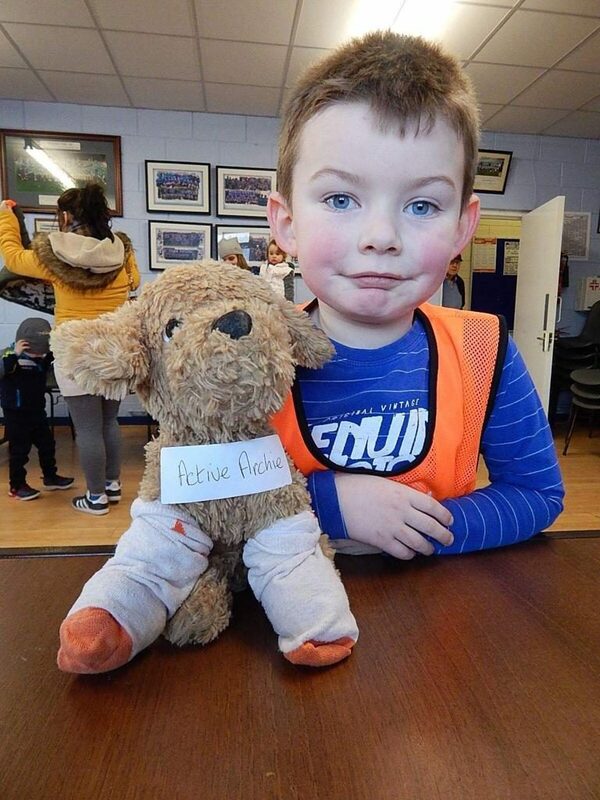 But did you know Nenagh Éire Óg have their own version called Where’s Mattie? See you if can spot the world’s greatest logistics manager and All-Ireland hide and seek champion in the photograph below. A father and son combination, the senior hurlers have their first competitive fixture this Friday evening while the under-14 hurlers qualify for the North Tipperary Féile final. All this and more in this week’s bumper edition of the news on the Blues. Our junior footballers travelled down to Cloneen to play St. Patrick’s in the opening match of the county league and despite an impressive performance were unlucky to lose 3-7 to 0-7. It is a testament to the players that they were willing to drive over one hour to play the game in awful weather conditions and indeed both sides have to be complimented for the high skill levels on show despite the inclement weather. 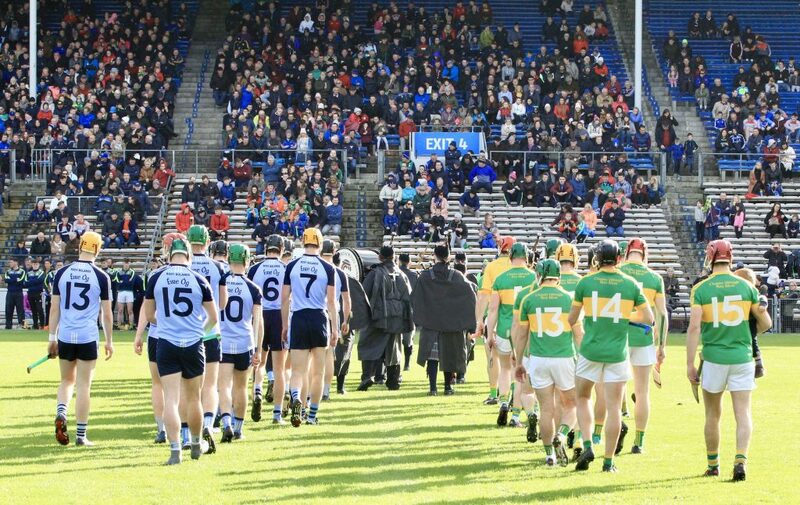 A special note about today’s game is that we got to witness something very rare in Gaelic games and indeed something rarer still in Nenagh Éire Óg in that we saw a father and son play together. Conal Ryan came on as a second half substitute and lined up in the forwards alongside his father Lenny. Well done lads. We wish Brian Carr and Kieran Mullarkey speedy recoveries from knocks picked up in today’s match. Our next game is on the weekend of April 24 against Lorrha & Dorrha. Hard luck to our minor footballers who were beaten by Kiladangan today in Puckaun 0-9 to 0-1 in the North championship. With heavy rain and a blizzard blowing in the second half, both sets of players deserve huge credit for the manner in which they went about their business. 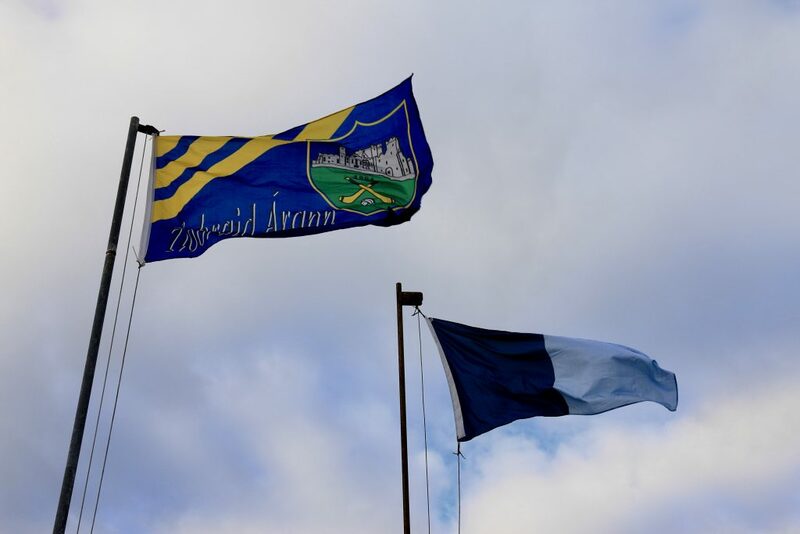 We have two games left in the round robin stages against Kilruane MacDonagh’s and Inane Rovers with the Kilruane game taking place on Sunday at 12 noon in Nenagh. 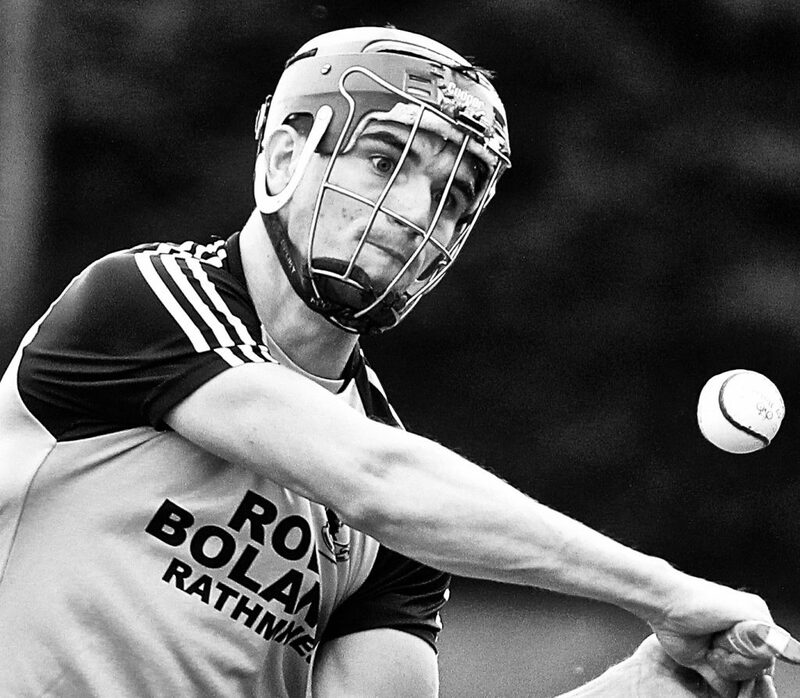 Best of luck to our senior hurlers who play their opening match in this year’s county league against Clonoulty Rossmore this Friday evening, under lights, at 8pm in Clonoulty. Our junior-B hurlers have been drawn to play Portroe, Silvermines, Lorrha & Dorrha and Borrisokane in the North Tipperary hurling league. Our first game is against Portroe on the weekend of 23 March in Portroe. In the junior-A league we play Toomevara, Roscrea and Burgess. Our opening match is on the weekend of 23 March in MacDonagh Park. 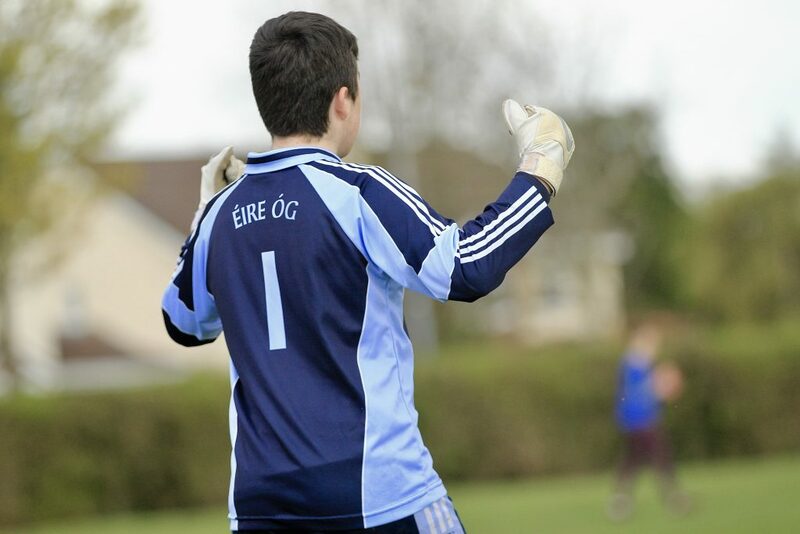 Congratulations to Mark Carey and Borrisokane Community School who qualified for the All-Ireland final on Saturday defeating Coláiste Naomh Cormac, Kilcormac. Best of luck in the final. Well done to our under-14 Féile hurlers who beat Borris-Ileigh on Saturday in Borrisoleigh. It finished 4-07 to 2-04. Played in very poor and windy conditions, both teams left everything on the field in a very entertaining contest to watch. The lads will now face the winners of Toomevara and Roscrea in the North final. Membership is now due for all our players. Please return completed forms to mentors as soon as possible. Our club will once again feature in the St. Patrick’s Day parade and mentors will in touch shortly with the details. The Senior team have their second league match next Sunday away to Cashel and hope to put in another strong performance. Best of luck. 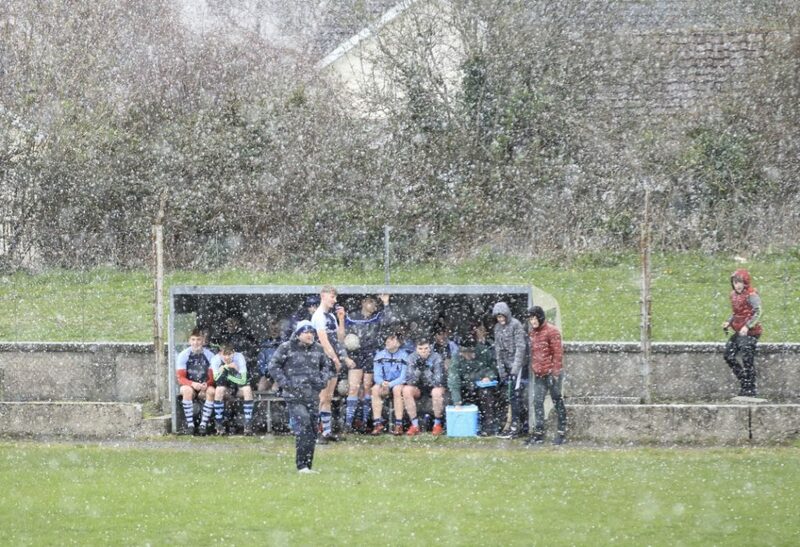 Despite the harsh weather conditions and being the first league match of the year for the team away to Moneygall, both teams played very well. 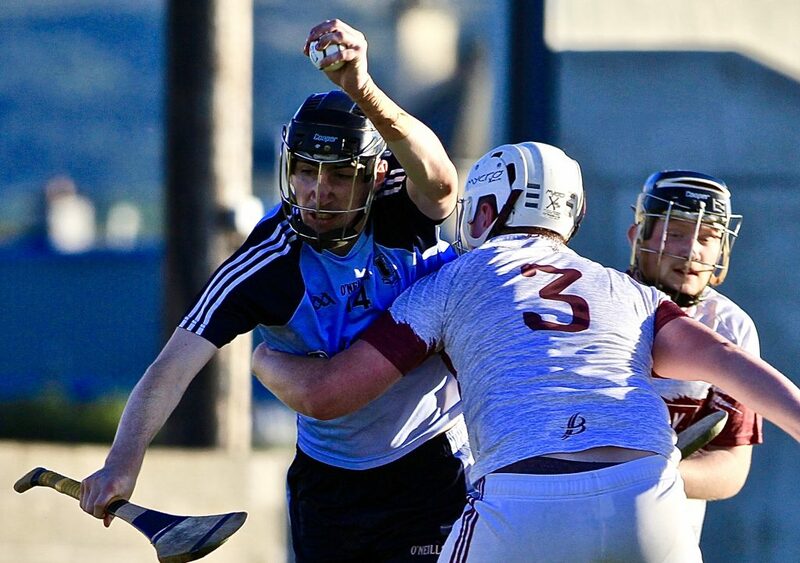 All the hard work in training and during the match led Nenagh Éire Óg to a narrow win. With another match coming up soon, more details will be made available at training. Under-12 training will continue on Wednesday evening and note the time change since last week from 7pm-8pm at Nenagh College. We will collect €2 per player at the gate toward the rent & lights. This is our new training time and venue until we go back on the pitch. Under-10 camogie training continues in Nenagh College at 9am Saturday morning. €2 at the gate. Newcomers las are always welcome. All girls must wear helmets and shinguards. Training takes place every Thursday evening for the under-6s and under-8s in the large hall in St. Mary’s Secondary School. No helmets or hurleys needed initially. As with the Ógres camp we will need as many parents to help as possible to make it worthwhile and fun for the girls. Registration forms will continue to be handed out at training this week. 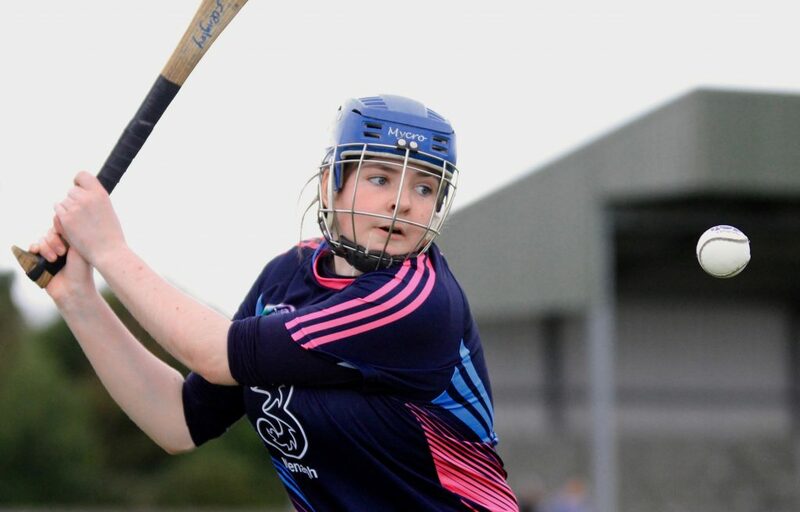 All camogie players must register for insurance purposes so it would be appreciated if players could fill out the forms and sign up for 2019 as soon as possible. 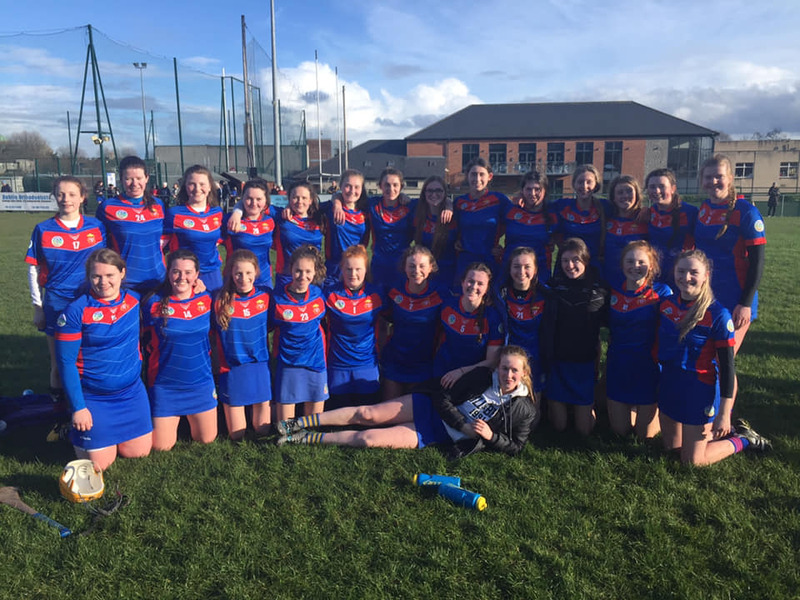 St. Mary’s Secondary School Nenagh played in the All-Ireland Senior B Final last Saturday against Castlecomer Community School from Kilkenny. Éire Óg were well represented by Niamh Sheridan, Caroline Browne, Megan Grace ,Ciara Sherlock, Rachel O ‘Connor and Lucy Spain. Unfortunately St.Mary’s lost out on a scoreline of 2.6 to 0.7 but it was a gallant effort from the girls and a great achievement to get to the final. 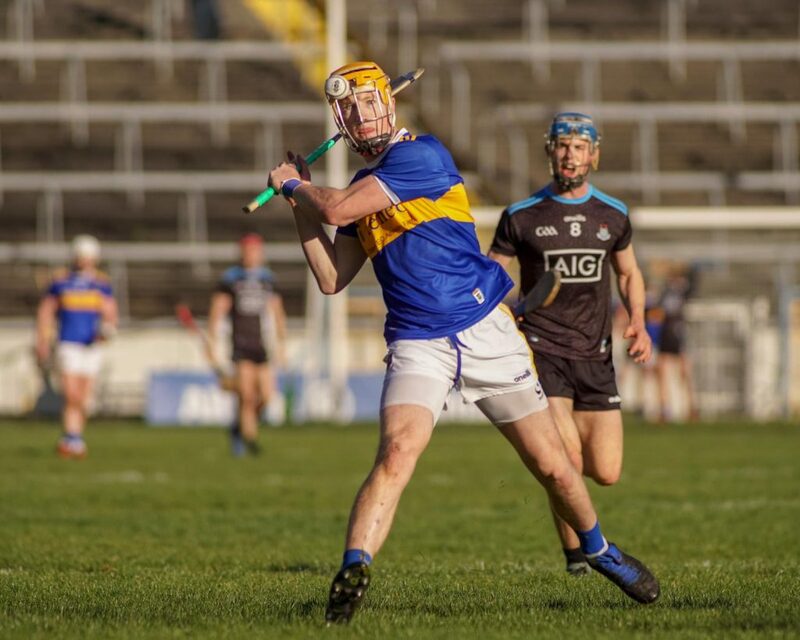 Tipperary: Hard luck to Barry Heffernan, Jake Morris and the Tipperary senior hurlers who were defeated by Kilkenny on Sunday last. The lads face a difficult trip down South to Cork next Sunday and we wish them the very best. Colleges: Commiserations go to Philip Hickey who was part of the Mary Immaculate side defeated by UCC in the Fitzgibbon Cup final on Saturday last. Hard luck also to Peter Folan and Bob O’Brien of IT Tralee who were beaten in the Ryan Cup semi-final by Ulster University. Minor Football: Hard luck to the minors who were beaten by Ballina on Sunday, 2-4 to 1-11 in the North championship. They now face Kiladangan next Sunday in Puckane at 12pm. Junior Football: Our junior footballers play St. Patrick’s Drangan on Sunday next at 12pm in Cloneen in the county league. This is the first time we have ever entered the county junior league so this game will create it’s own piece of history. Best of luck to all involved. Membership: Reminder to all our players to pay their membership so that they are covered by insurance. This can be done online on our website by clicking here. 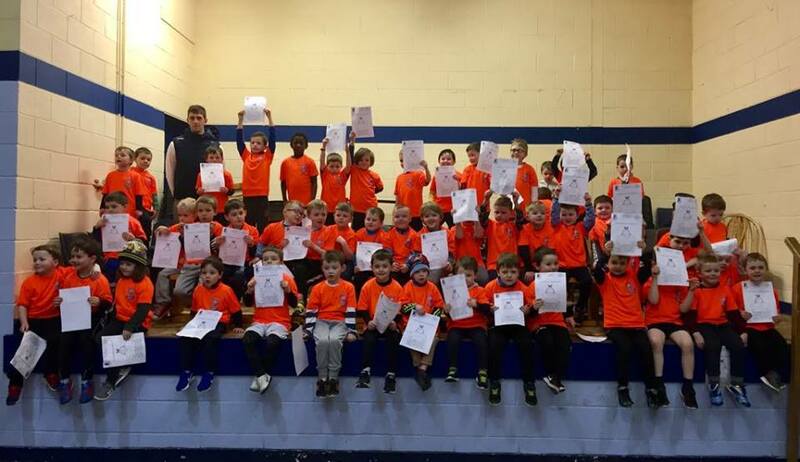 Under-6: Congratulations to all of the boys who completed the Éire Ógres GAA for beginners camp on Saturday. Many thanks to the mentors, parents and our sponsors, Nenagh EBS. Our Tipp star Barry Heffernan made the boy’s day by presenting the T-shirts and Certs. A credit to their families and schools, the boys brought joy to all involved with the camp. 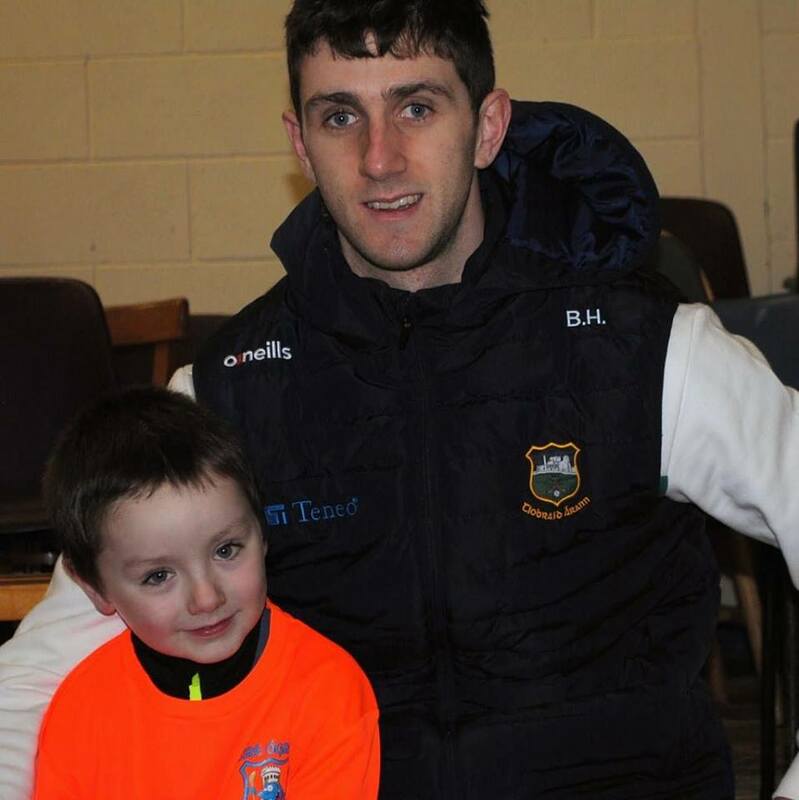 Under-6 training with Cathal and mentors continues in the hall on Saturday from 10am-11am. See you all there. Membership: Membership is now due. All boys have received forms which should be returned to mentors. Non-members will not be eligible to train or play in matches. Contact 086 0855165 with any issues. Best Wishes: One of our little under-6 boys decided to sneak in to hospital this week to sort out our health system. Your friends are delighted to hear that you are home and on the mend. Be back soon, Jake! 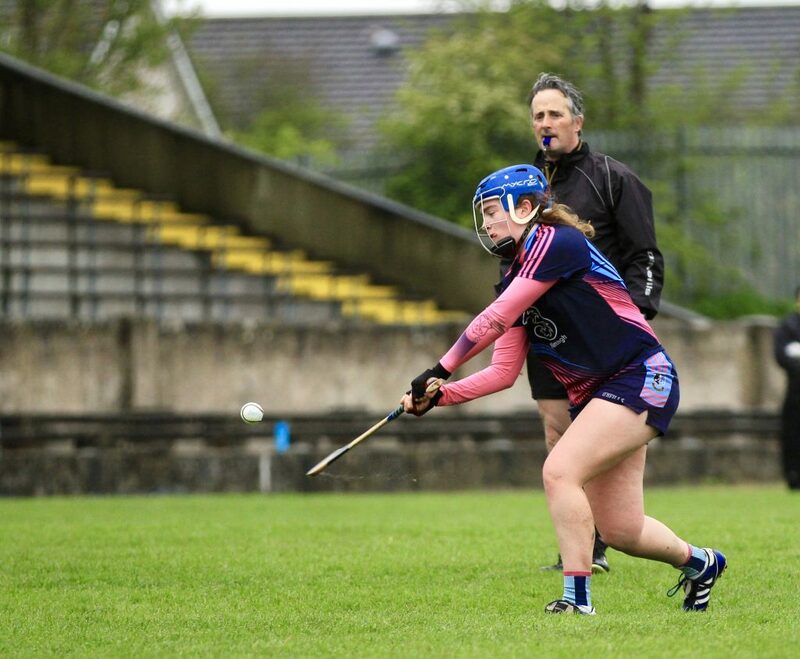 The Tipperary senior camogie team beat Waterford on Sunday in the Littlewoods league on a score of 1 -11 to 0-10 away in Waterford and well done to Nenagh Éire Óg’s Grace O’Brien who played corner forward. The seniors had their first league match of the year away to Éire Óg Annacarty last weekend. Despite an excellent performance from everyone the team went down by two points in really competitive match. Training takes place next Sunday as usual. The match scheduled for the under 16s was deferred last weekend as the Tipperary under-16s were in action. Players will be sent a text on the training times during the week with more matches coming up in the weeks ahead. Under-12 training will continue on Wednesday evening but please note the time change this week to 7-8pm at Nenagh College. We will collect €2 per player at the gate toward the rent & lights. This is our new training time and venue until we go back on the pitch. Under-10 camogie training continues in Nenagh College at 9am Saturday morning. €2 at the gate Newcomers are always welcome. All girls must wear helmets and shinguards. 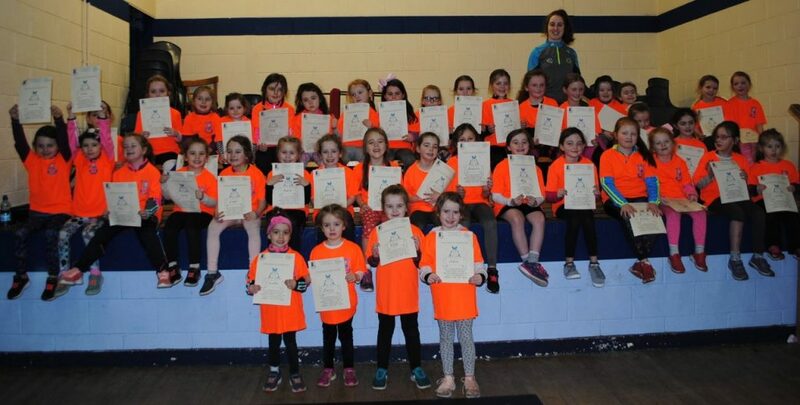 Saturday morning marked the end of “The EBS Nenagh Éire Ógres” with a visit from our county star Grace O’Brien who graciously took the time to present the girls with their certificates and t-shirts. Grace won another Ashbourne Cup medal with the University of Limerick in the past few weeks and is a great role model for our young Ógres. We wish her the very best with Tipperary this year. Throughout the four weeks the focus was on fostering an enjoyment of the skills learned, encouraging parental involvement and developing enthusiasm for the sport. We held our registration morning this morning and lots of the girls joined up to continue playing with our under-6 and under-8 teams this year. Training begins this coming week and details will be shared on the parents WhatsApp group. Any new players who wish to give it a try can contact the club through our social media platforms. Our thanks to the many coaches, parents and older sisters who gave up their precious time to ensure the girls had a wonderful time. Huge thanks must also go to the hard working committee who worked tirelessly behind the scenes ordering t-shirts, registering the girls, providing lovely food and all the other jobs that they did. 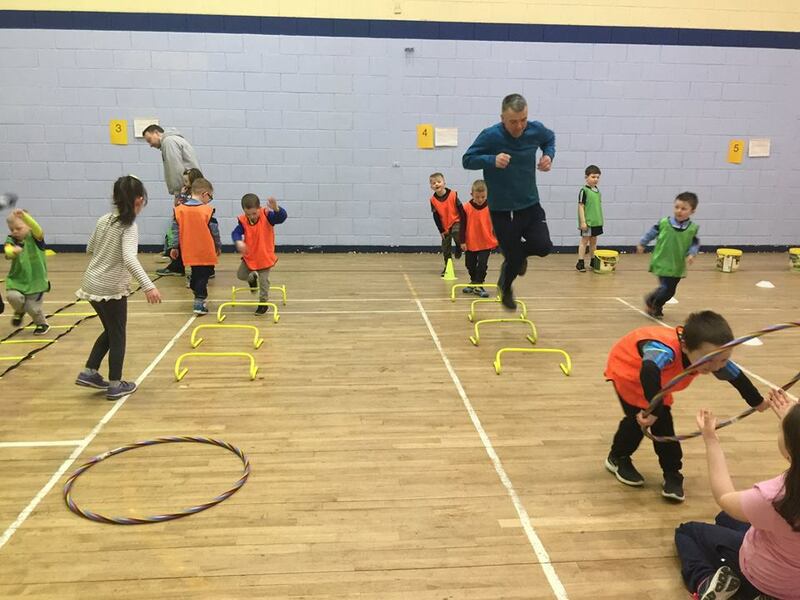 Training will take place every Thursday evening from 5.45pm to 6.45p.m starting on Thursday the 28th of February for under-6s and under-8s in the large hall in St. Mary’s Secondary School. These sessions will be for members of the camogie club (registration possible at the venue) and will continue for four to five weeks until the light improves and weather allows us to go onto the pitch for the Summer. No helmets or hurleys needed initially. As with the Ógres camp we will need as many parents to help as possible to make it worthwhile and fun for the girls. 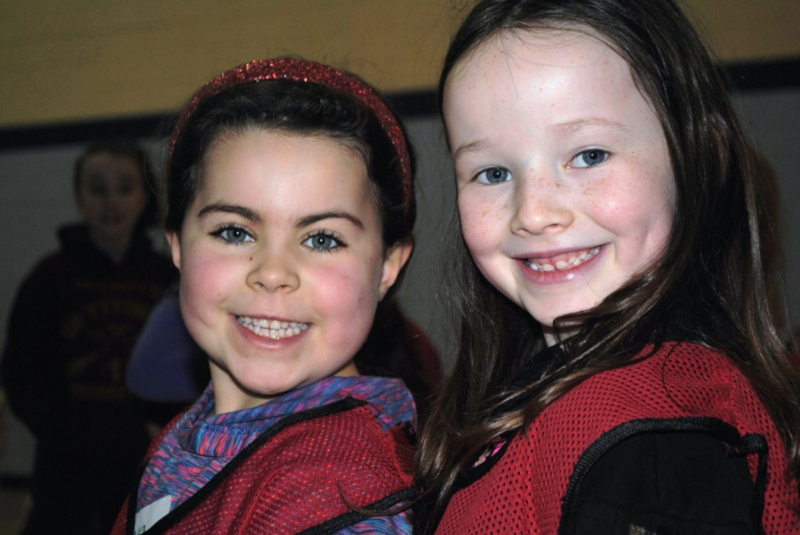 For girls born in 2011 there is a short-term option of joining in with the under-10s on Saturday mornings at 9am in Nenagh College astro until the 6s and 8s move back to the pitch. There is a €2 charge and parents must stay and assist. Thanks to all who registered on Saturday morning at the club. Registration forms will be handed out at training this week. 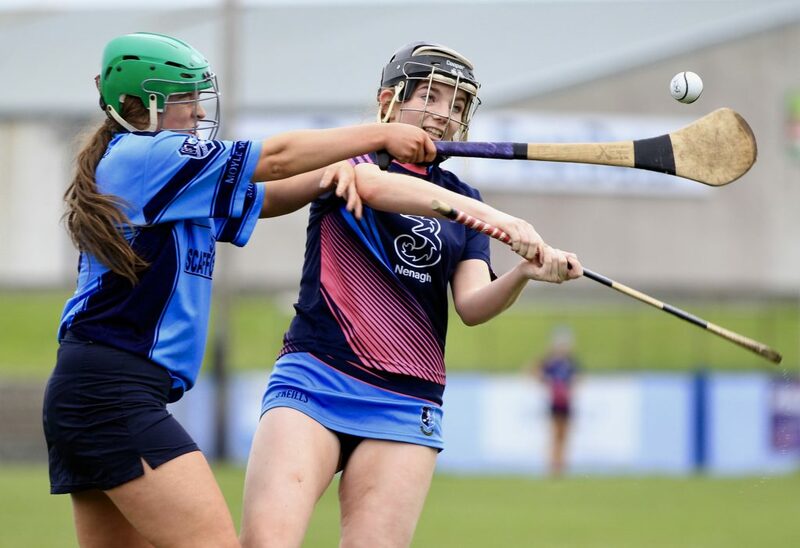 All Camogie players must register for insurance purposes so it would be appreciated if players could fill out the forms and sign up for 2019 as soon as possible. The 5 x 50 euro lucky dip winners were….. Does anyone recognise the young lad on the right? The competitive season is due to start shortly and our senior hurlers will renew rivalry with Clonoulty Rossmore in a repeat of last year’s county senior hurling final in the opening round of the county league. 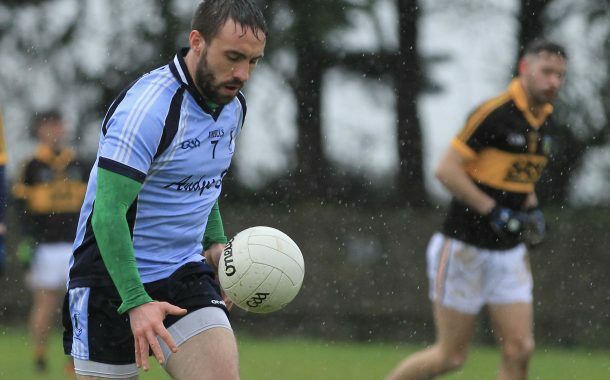 This game is expected to take place on Sunday, March 10th at 12pm in Clonoulty while we expect to play our next game in the league the following Sunday at 12pm in MacDonagh Park against Loughmore Castliney. Our junior-B footballers expect to play their opening match of the county league in Drangan on Sunday, March 3rd against St. Patrick’s at 12pm. The lads will play Clerihan in MacDonagh Park in their second match and travel to Kilcommon to play Seán Treacy’s in the final group game of the league later in the year. They will play their opening match of the county junior-B championship against Lorrha & Dorrha in St. Ruadhan’s Park on the weekend of April 21st and will play Galtee Rovers and Éire Óg Annacarty next in the championship with both games fixed for MacDonagh Park. The minor footballers play Ballina on Sunday morning at 11am in MacDonagh Park in the North minor-A championship. Students Looking for Part-Time Work? 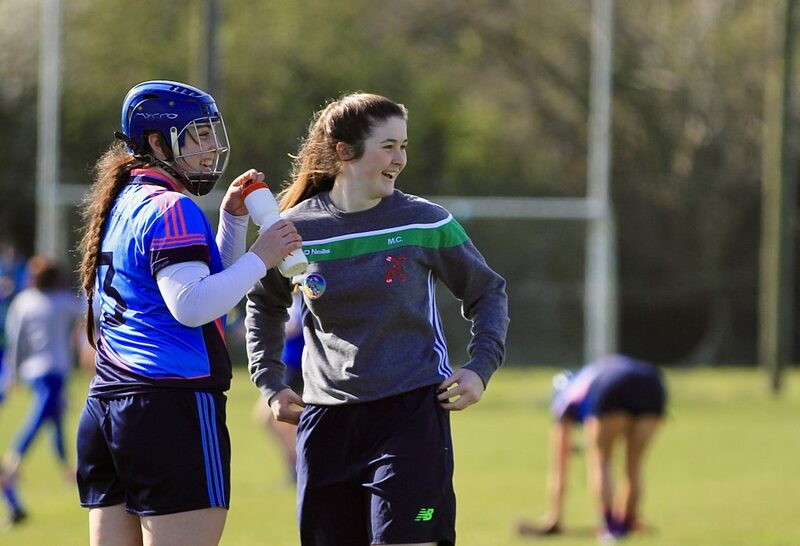 The Tipperary Coaching and Games Development are looking to recruit coaches for work on their Easter and Cúl Camps in 2019. Applicants must 17 on or before April 1st 2019. To apply please send a CV with cover letter via email to tipperarygaacamps@gmail.com. Closing date for applicants is Friday 22nd March. 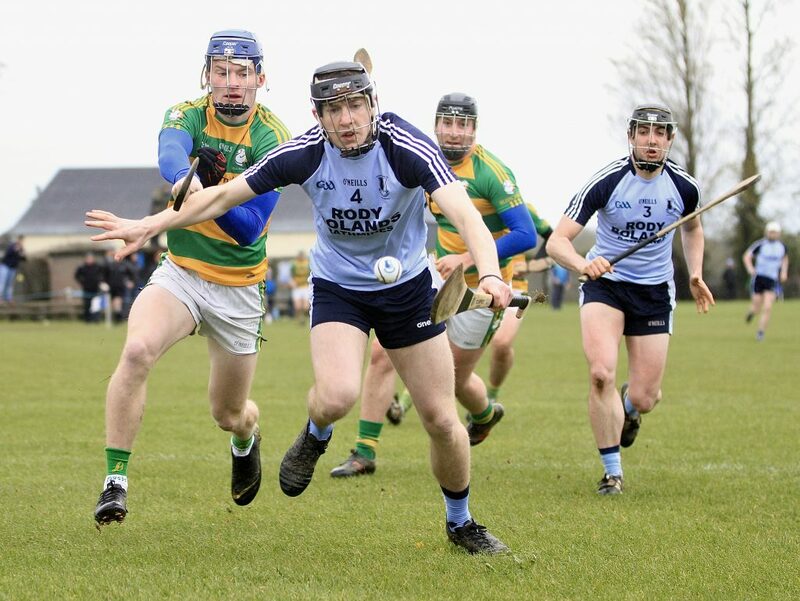 Best wishes go to Philip Hickey and Mary Immaculate College, Limerick who play University College Cork in this year’s Electric Ireland Fitzgibbon Cup final next Saturday in Waterford. 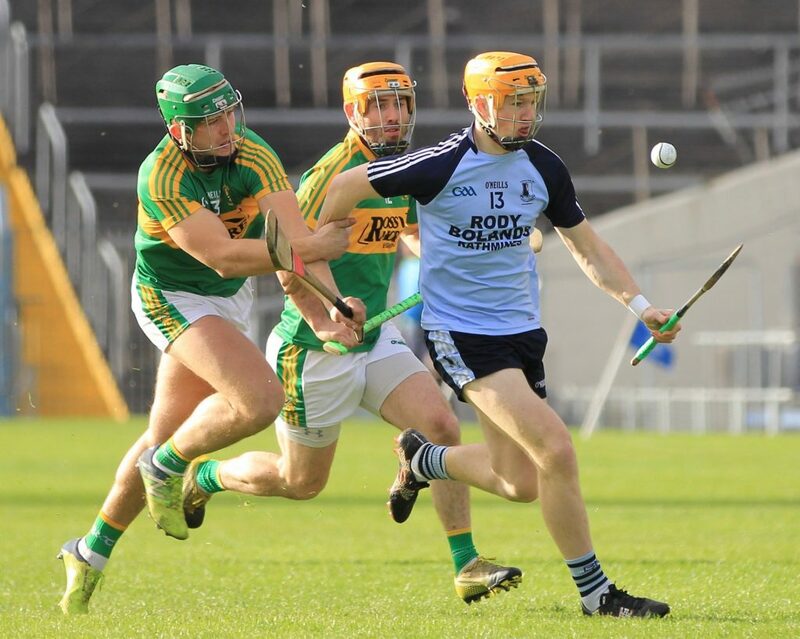 Mary Immaculate overcame the challenge of Shane Hennessy’s NUI Galway 1-18 to 0-18 in the semi-final in Cusack Park, Ennis on Thurles. Commiserations to Shane who had a fine season in goals for the Connacht college and good luck to Philip in the final. Mick Darcy 1922-23, 1923-24, 1926-27 UCD. Mattie Ryan 1967-68, 1968-69, UCD. Hopefully we will be adding Philip’s name to the list and if we are missing anyone please email us the details to eireognenagh@gmail.com or contact us through any of our social media channels. 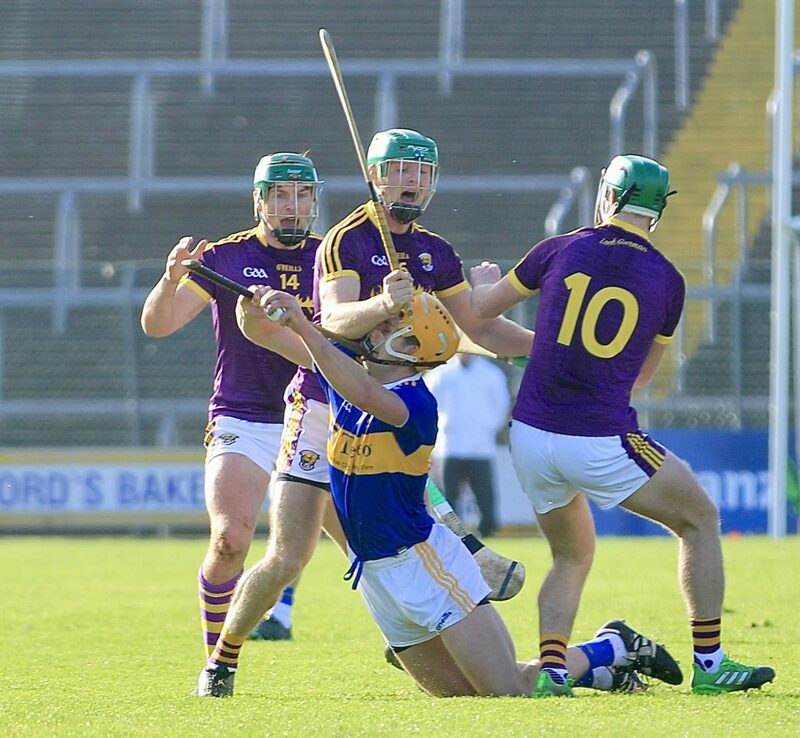 Hard luck to Barry Heffernan, Jake Morris and the Tipperary seniors who were defeated by Wexford thanks to a last minute point by Aidan Nolan, 1-15 to 1-14 today in Innovate Wexford Park. The lads must regroup now for the next Sunday when Kilkenny travel to Semple Stadium. 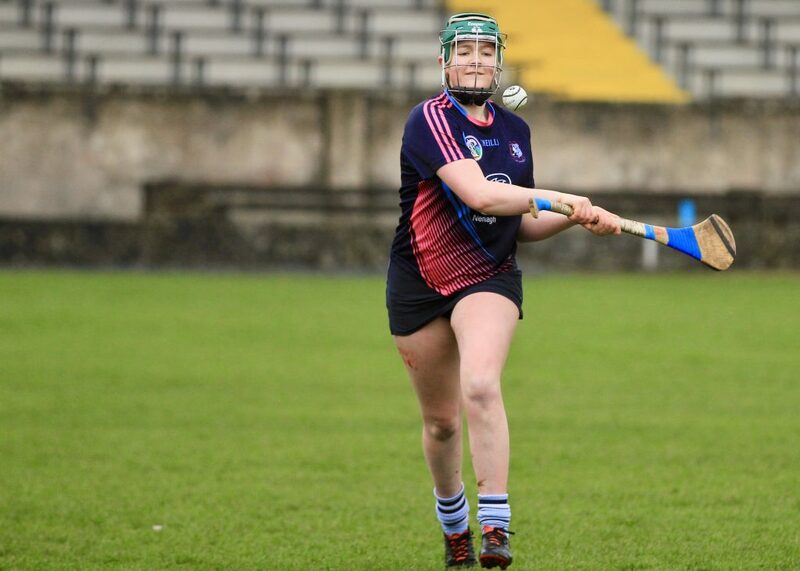 Meanwhile there was better news for Grace O’Brien as the Tipperary senior camogs overcame Wexford today in Enniscorthy, 5-11 to 0-8 in the league. Grace managed a first-half point in the game. 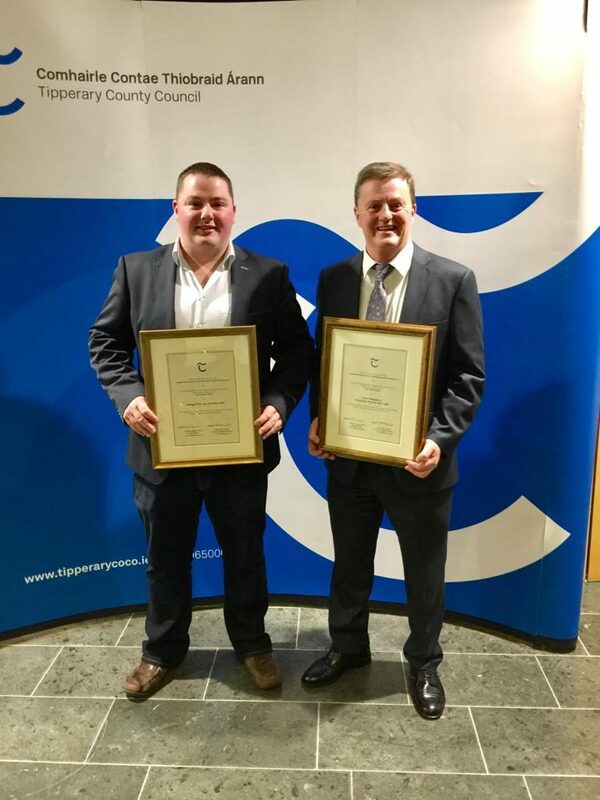 The Award One Youth Course is being run by North Tipperary coaching development officer Paudie Malone. Paudie Butler was taking the session last week in Kilruane MacDonagh’s GAA club. 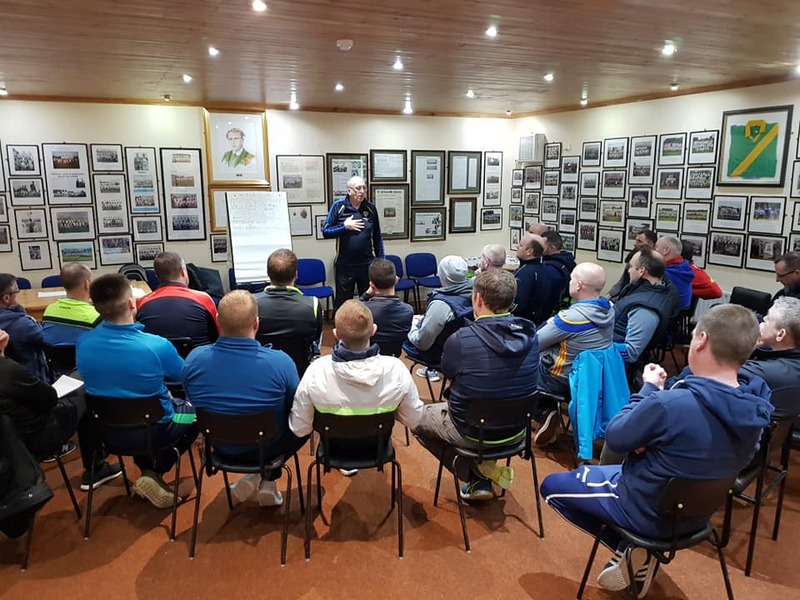 Our thanks to our four coaches Mike Corrigan, Tom Coughlan, Tom Boland and Cathal Farrell who are giving up their own time to develop their own coaching knowledge over the five nights of the course. It’s a great course and will greatly benefit the underage players in the club. 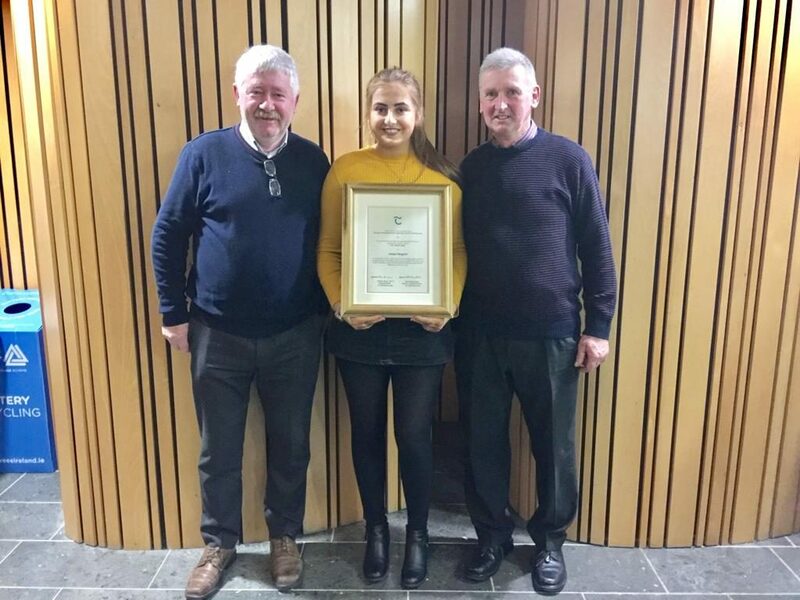 Last week the club was honoured by a civic reception in the council offices on the Limerick Road. 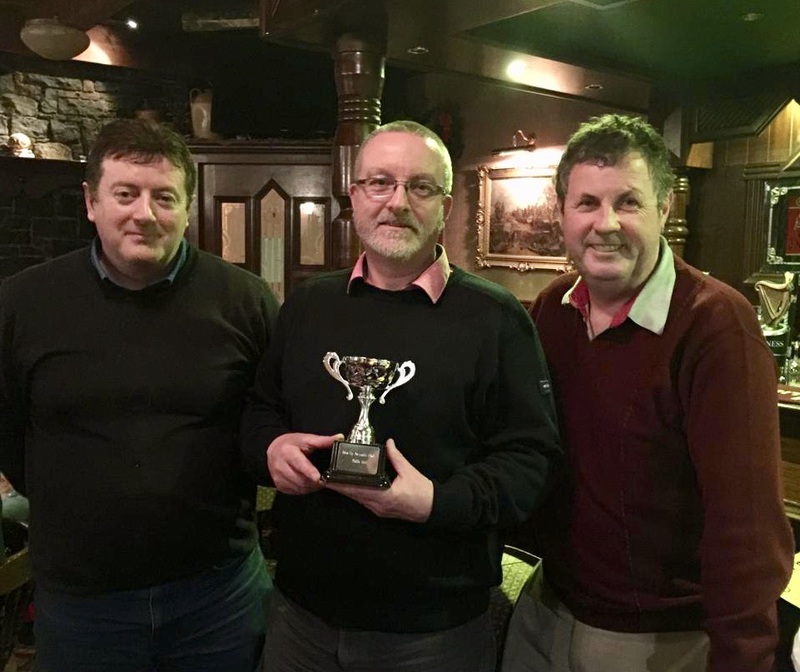 Firstly former player and coach Seán Minogue was honoured for his exploits on the pitch and putt courses after he won the British Open and the Dutch open. 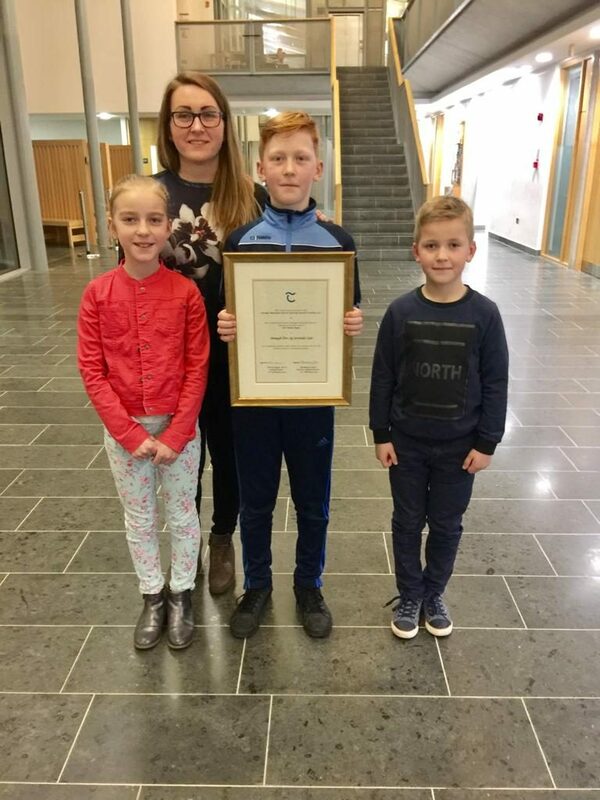 Secondly our under-11 hurlers were also honoured after winning the All-Ireland Community Games final last summer in Limerick while world champion handballer, Sinead Meagher of Nenagh Handball Club, was recognised for her outstanding achievements in 2018. Also recognised was juvenile coach Brian O’Brien who also won a world handball championship. The sporting talent in our town is amazing and it is fantastic to see it officially recognised. The under-11 panel with club stalwart Tommy Mulcahy. Tommy was the boys first coach at under-6 level and set them on the path to All-Ireland glory. Well done to our Ógres who are turning into young athletes before our eyes. They are rising to the extra challenges each week. Parental and sibling involvement has played a huge part in this. Well done to all. We conclude for another year on Saturday, with T-Shirt and certificate presentation. Juvenile registration will take place in the complex on Saturday, February 23rd from 10am to 12 noon. Club registration for all camogie ages will take place this Saturday 23rd at the complex from 11am until 12pm. Forms can be picked up at training during the week or on Saturday morning. 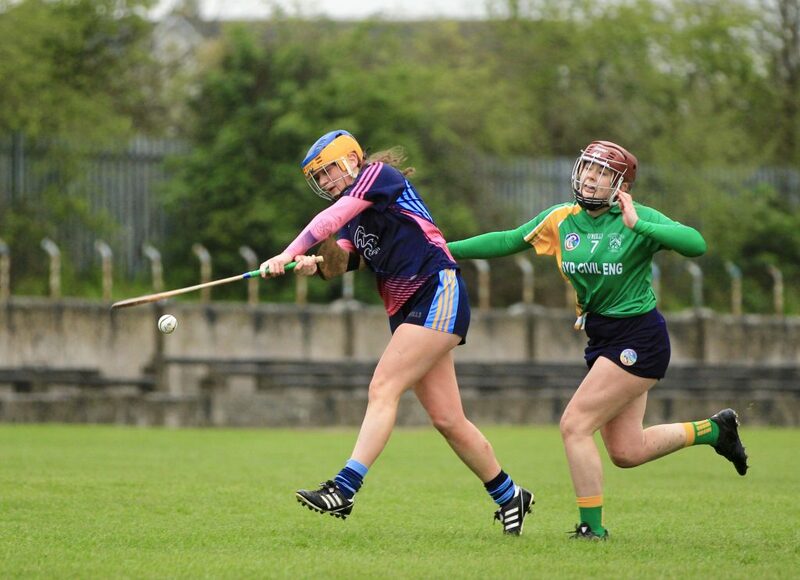 All camogie players must register for insurance purposes. 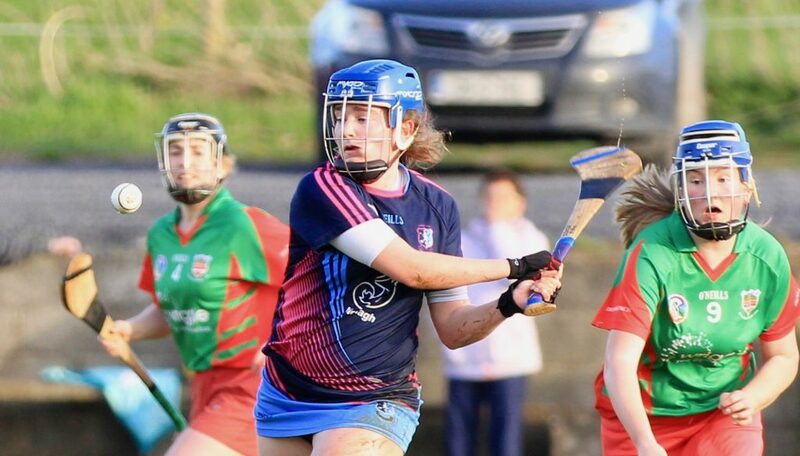 Best of luck to the Nenagh Éire Óg camogie senior team in their first league match of the year next Sunday against Annacarty. The under-16s have their first match next weekend. Training takes place on Tuesday and Thursday. 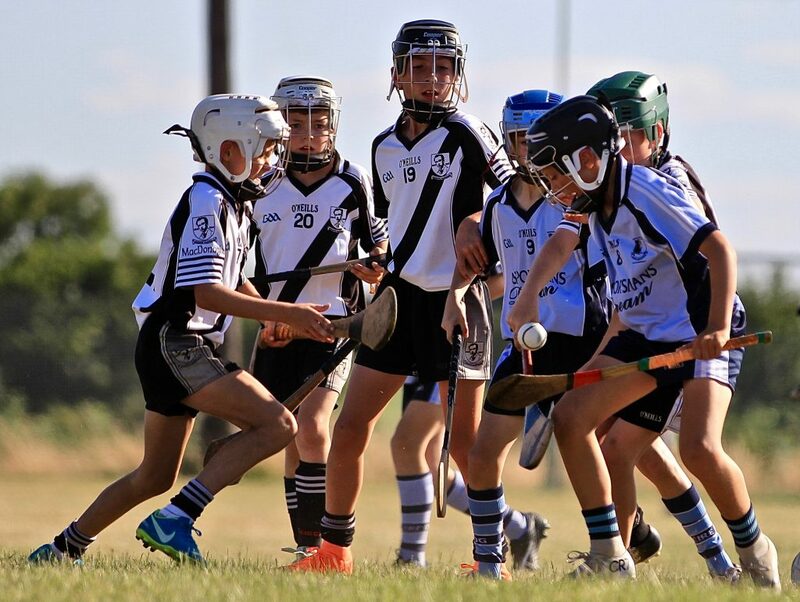 Under-12 training continues every Wednesday evening 6:00pm – 7:00pm in the ball alley at the Nenagh Éire Óg complex. Newcomers are always welcome. 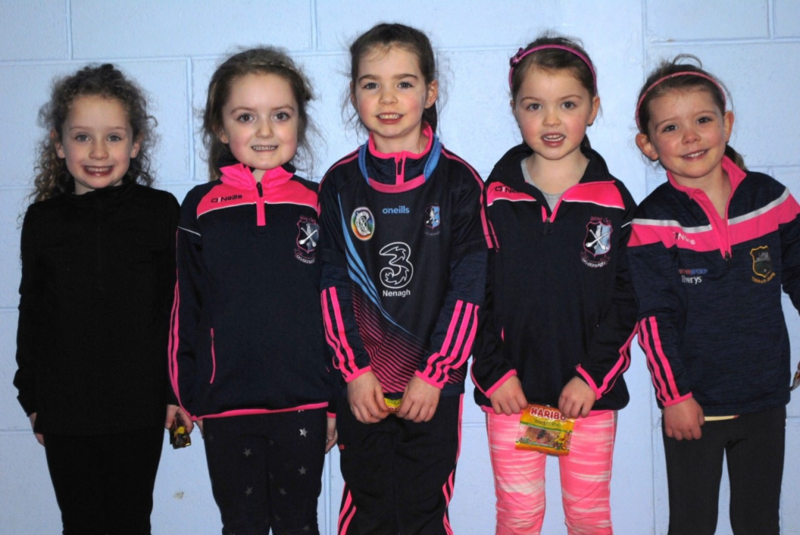 Under-10 camogie training continues in Nenagh College at 9am on Saturday morning. €2 at the gate Newcomers are always welcome. All girls must wear helmets and shinguards. 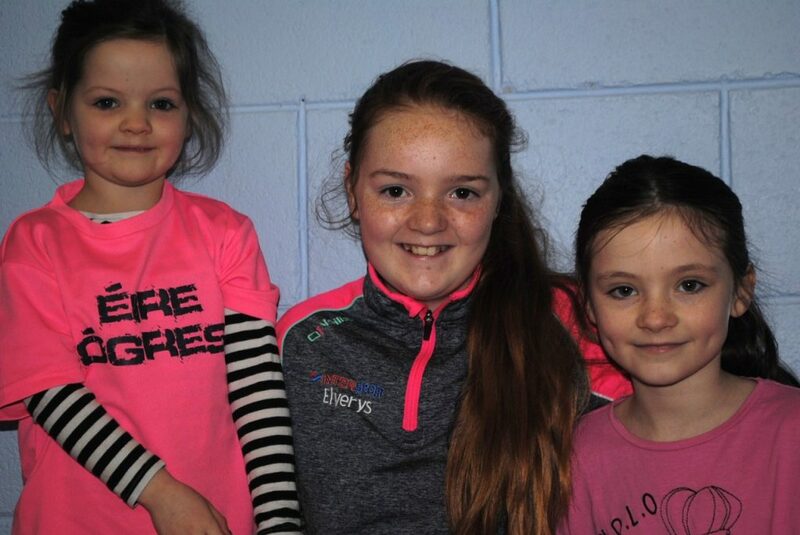 The third morning of the Éire Ógres got underway at the club last Saturday with almost fifty girls participating in a variety of activities. The children are improving their motor and physical skills with the main focus being on having fun. Help from older siblings and parents has helped hugely in creating a lovely atmosphere in the hall each week and the treats afterwards have ensured that there are lots of happy faces at the end of the session. Registration will take place during the Ógres next week for any child who wishes to continue playing for the year. Our weekly walks continue this Thursday for the sixth time this year and we will hoping to cover 5.5KM. These walks are open to people from Nenagh and beyond and everyone is welcome for what is a lovely, relaxed and social atmosphere. There was one winner of this weeks jackpot of €1,800. The 2 x 50 lucky dip winners were…..